My immune system hasn’t so far dealt the killer blow to the virus and so, like a broken winded horse, I’m still hampered by clogged up airways and laboured breathing so that’s all there is to say really. Today looked like being a decent day so once again, in keeping with my current limitations, we chose a walk which didn’t involve anything much by way of very steep climbing and, by way of a bonus, one which only involved a very short drive from home to the start point. 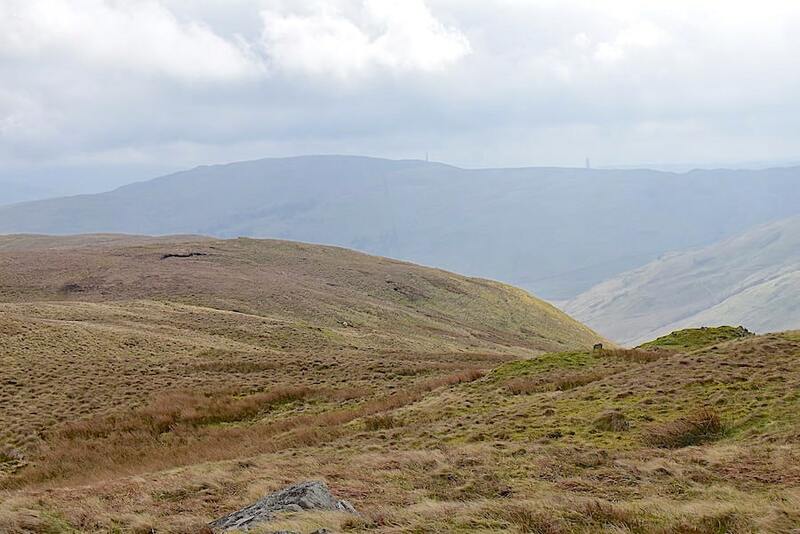 Today we chose to pay a return visit to the Shap Fells, where we took a couple of walks around the Borrowdale area in May 2018, and walk the fells on the eastern side of the valley which we didn’t include on either of those occasions, and then return to our start point via Bretherdale. We started today’s walk from the A6 lay-by at Shap Fell summit where this commemorative stone is located. 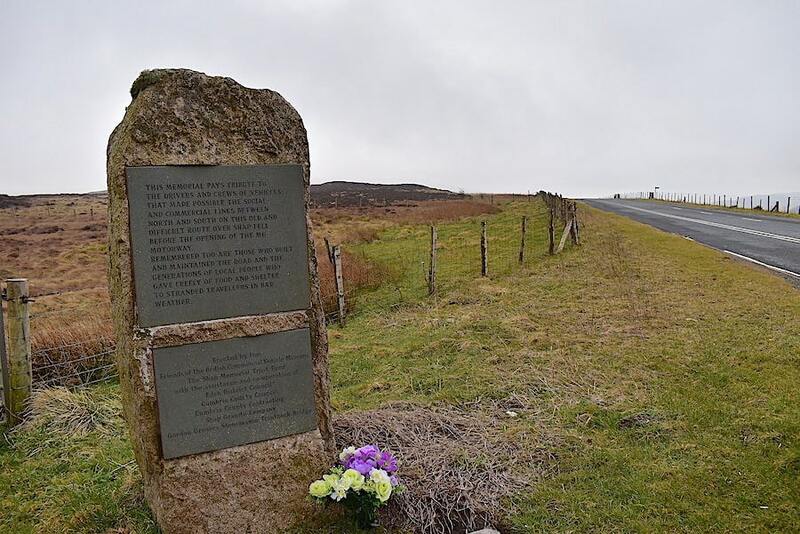 It pays tribute to all those who gave assistance to stranded drivers using this main north-south route during hazardous winter conditions, before the Westmorland section of the M6 was opened in 1970. I can clearly remember the reports and film footage on the news in those days showing the difficult conditions up here and how local people helped to dig out drivers trapped in the snow and provided food and overnight accommodation for them. Nice for everyone’s efforts to be remembered in this way and I think of them every time we pass the memorial on the drive to Kendal and back. From the lay-by we walked a short distance due south to this handgate and stile where the signpost indicates the way to Bretherdale. The skies are grey and overcast and its very windy although, as its coming from the south west, it isn’t a very cold wind. 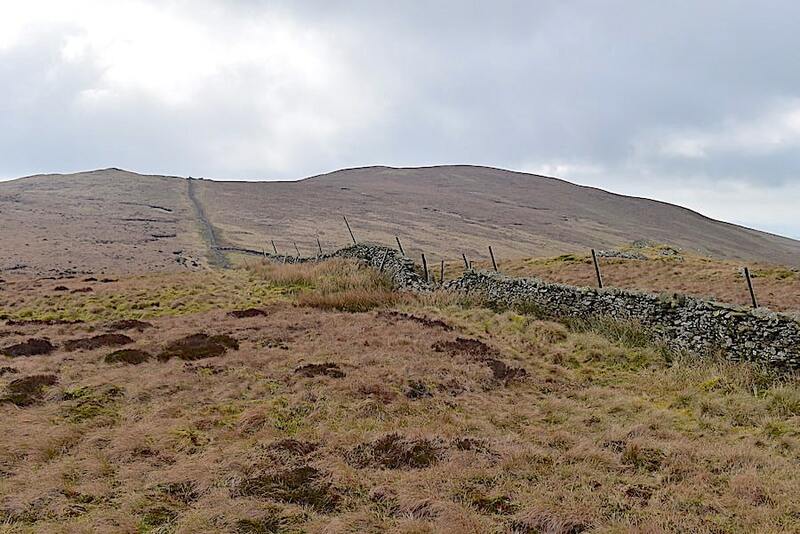 The A6 curves its way on to Kendal and we curve left over the stile to pick up the path. 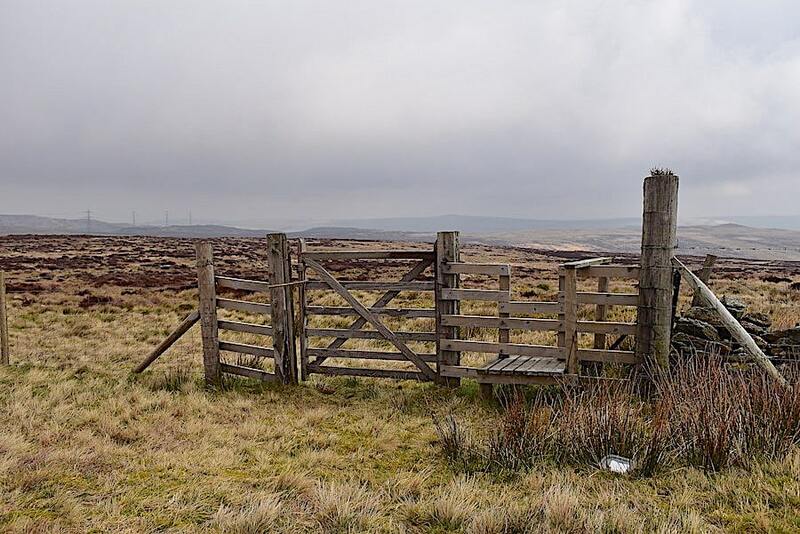 The rough grassy path is quite obvious and well trodden and leads us just a short distance over to this second gate and stile crossing which we cross and immediately turn up to the right. 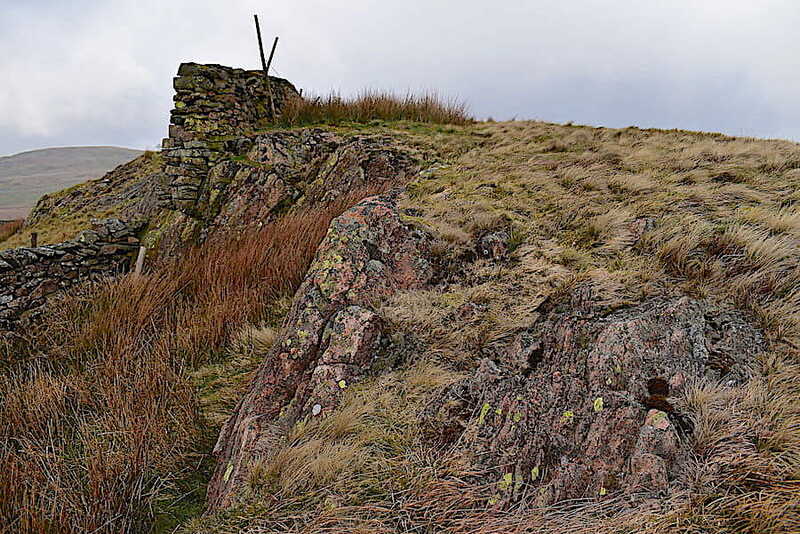 Marked on our route map, and shortly after crossing the second stile, we arrive at Red Crag, a rather grand name for this unprepossessing little cluster of rocks which does not even need to be clambered over …..
….. as the path simply threads its way between the rocks in the previous picture and these, on the other side of them, and then carries along on its way …..
….. in the direction of Crookdale Crag. 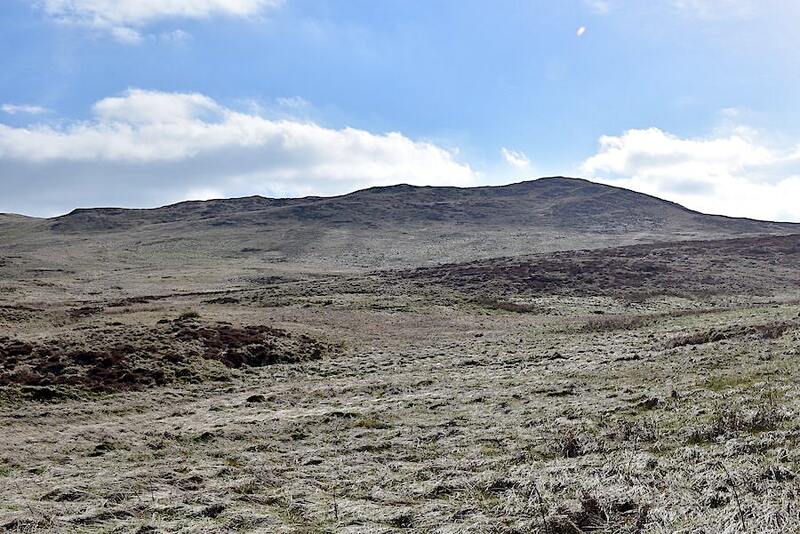 J strides out, gaiters on, as we’ve assumed it will be wet underfoot, and hood pulled up tightly against the wind which is hurtling in at us from stage right. The skies don’t look very promising at the moment but the forecast suggests that the cloud will eventually clear. 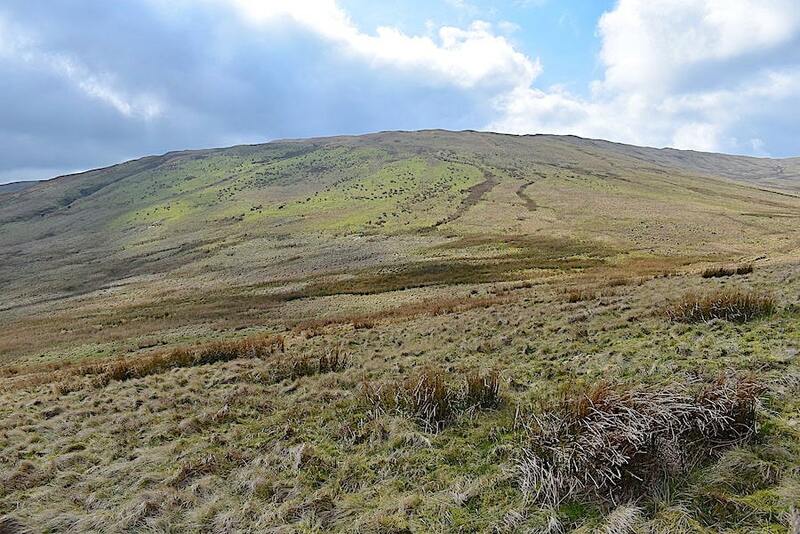 The gaiters were put to the test in the wet reedy depression between this point and the next rise. A look back at the route so far. 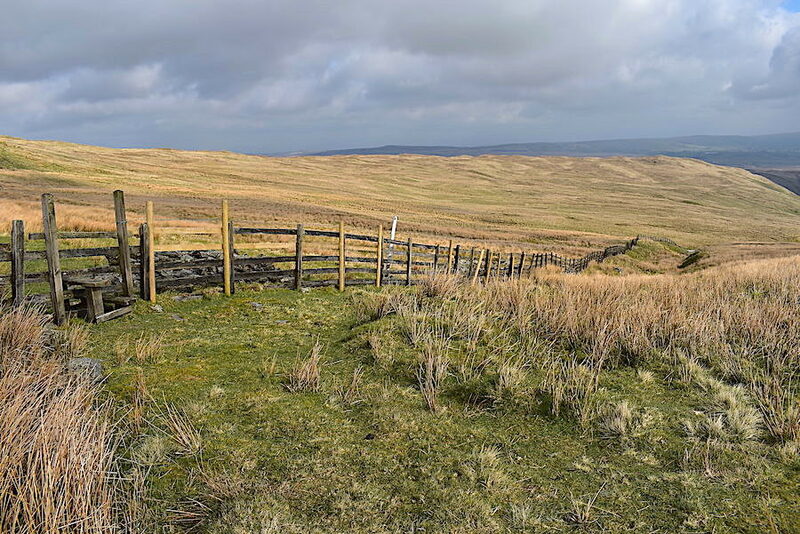 From the roadside stile we walked through the heathery patch to the left of the wall, crossed the wall/fence line at the second stile, turned right and then followed the wall up to the top of Crookdale Crag. 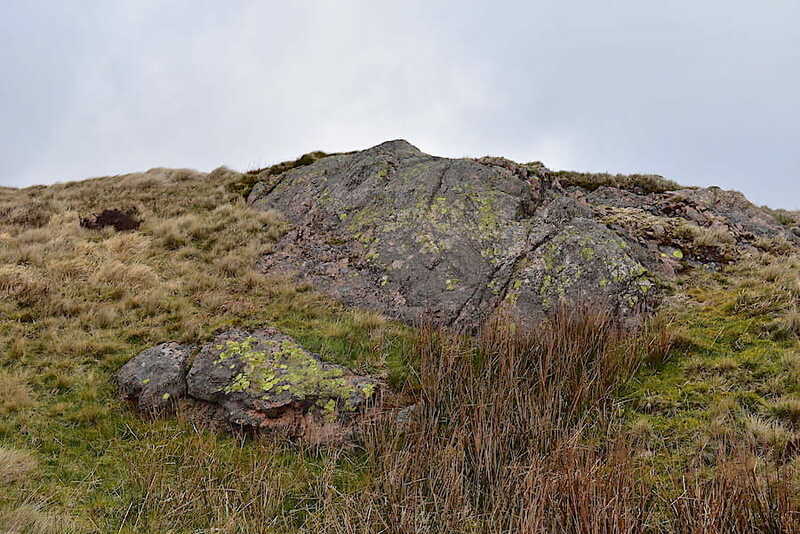 The Crag stands at 1500’/457 m and is pretty much the only stiffish climb on the whole of the walk. I managed it reasonably well with only one stop to deal with a very necessary nose-blowing interlude and the least said about that the better, I think. The cloud thinned a little and we were treated to splashes of sunlight on Whatshaw Common and Little Yarlside above Crookdale …..
….. but by the time I’d moved over for a better view down into Crookdale and the farm buildings at Crookdale Bridge the clouds had closed ranks once more and the gloom returned. 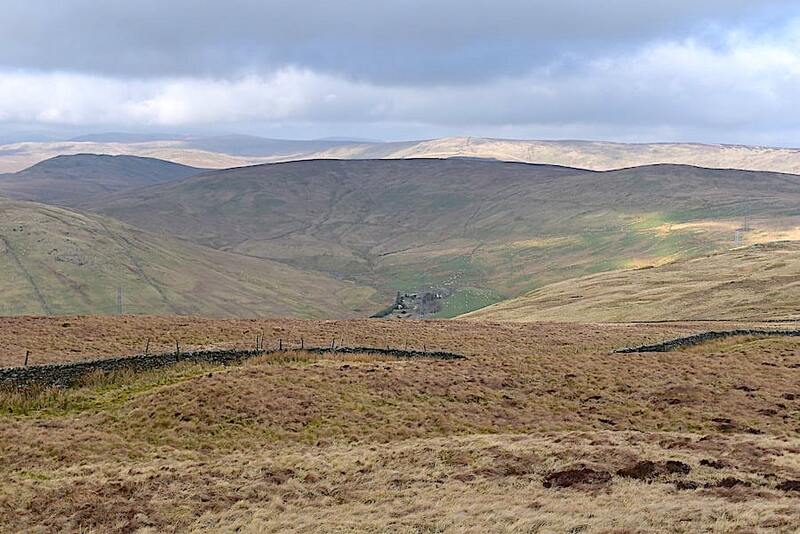 From Crookdale Crag we continue on across the rough grassland towards another minor, and nameless, top to the right of the wall. The wind is still being a nuisance and keeps blowing us off balance. 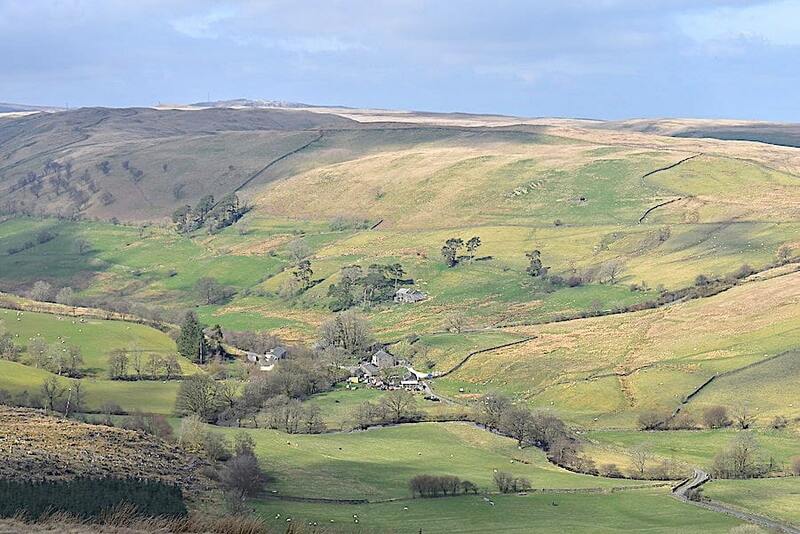 The view to our right as we cross over, with High House Bank, slightly sunlit on the right, and a shady Bannisdale Fell to the left of it. 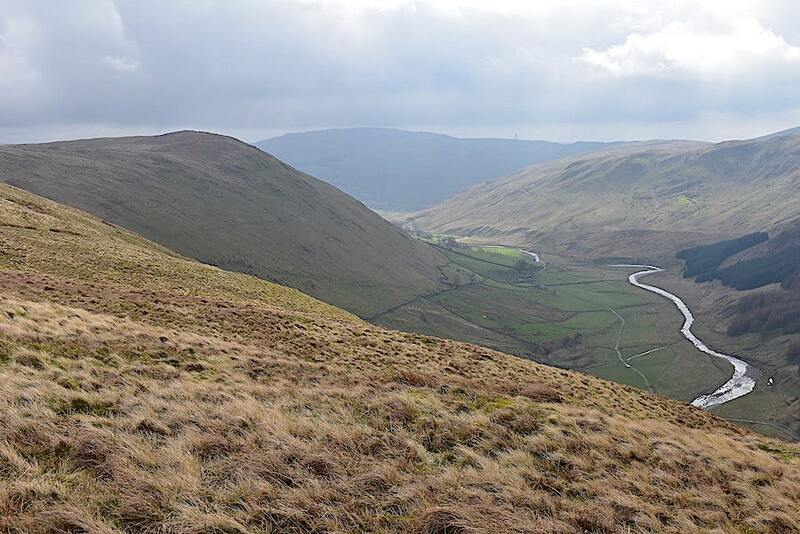 Another look along Crookdale with High House Bank now on the left and the shadowy Crookdale Fells to its right. 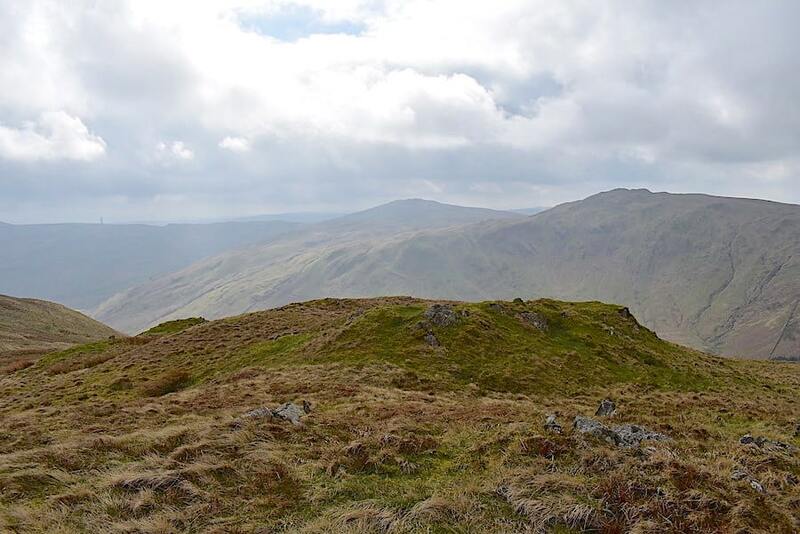 The cloud base has lifted considerably since we started out and we are beginning to see more frequent sunny interludes across the fells so all the signs are encouraging. 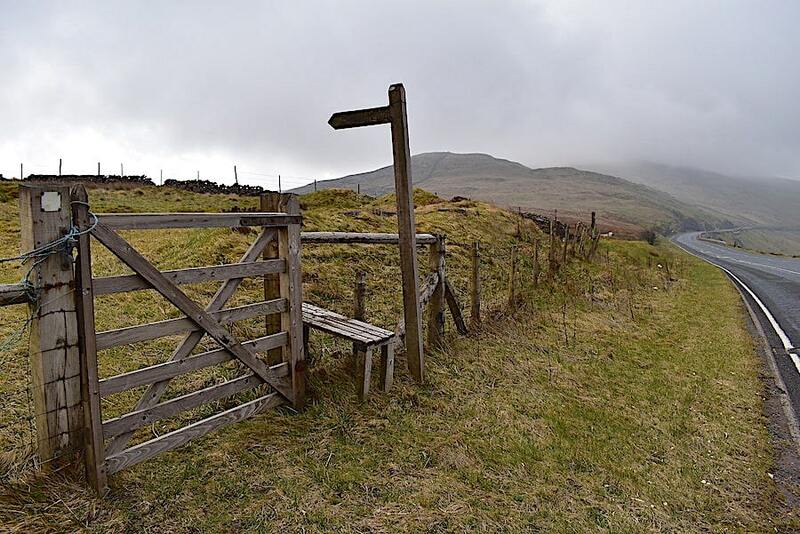 The lack of a stile or gate in the wall and fence discouraged us from crossing over to the highest point of the nameless top but, for anyone who may be interested its the one at 485m above Greenside Crag on the Borrowdale side. 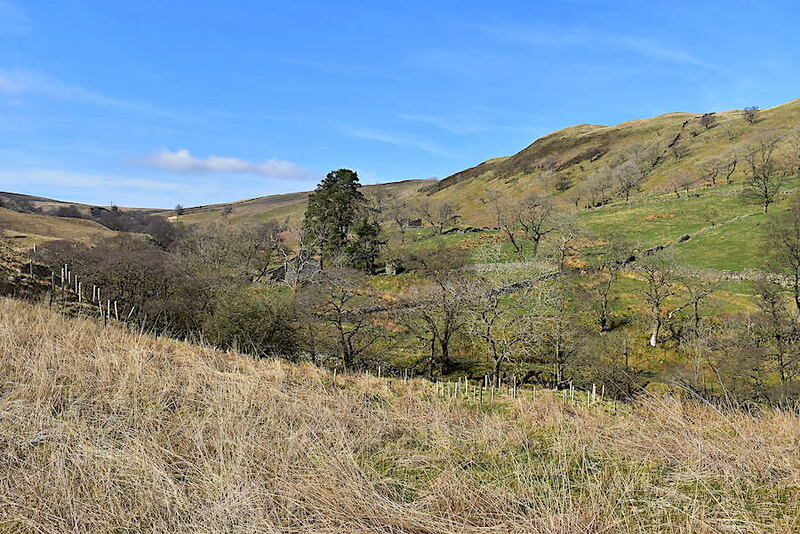 On we go, still following the wall, where there isn’t anything much by way of a path, until we come to …..
….. another fence from where, after crossing the stile, I took a look back at a sunny Bretherdale Bank. 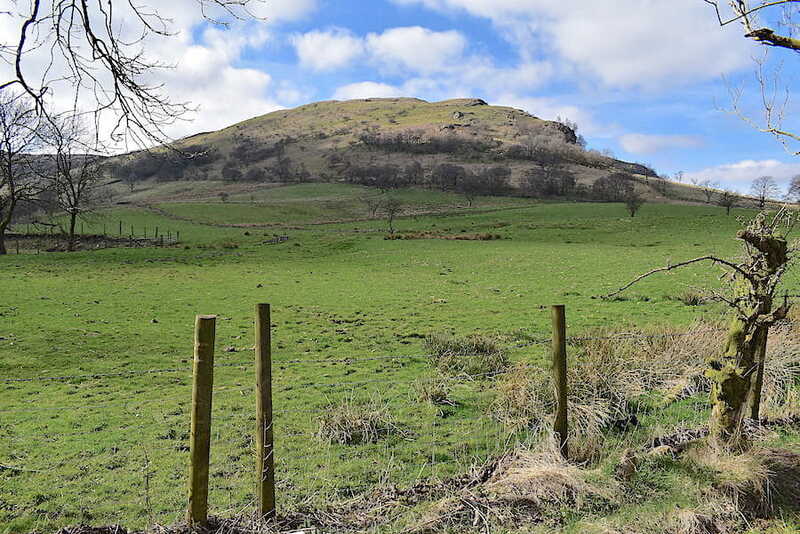 The heap of stones on the other side of the fence may once have been a sheepfold and if it wasn’t why has a heap of stones just been left beside the fence to no good purpose. Beyond the stile the tops of Mabbin Crag and Ashstead Fell begin to appear, together with a very welcome splash of sun …..
….. and at the crest of the rise even more of Mabbin Crag and Ashstead Fell appear across the Borrowdale valley and our conversation turns to the very enjoyable walk we had over there in May 2018. Making hay while the sun continues to shine, I find a higher piece of ground and take a look back at our route along the wall and the nameless top at 485m on the skyline to the left of it. 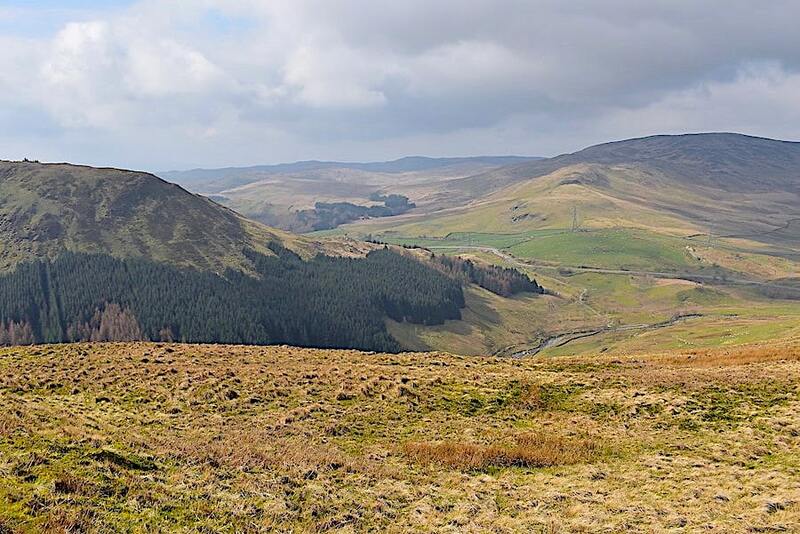 From the same vantage point I turn north eastwards for this view down to Bretherdale Head which we will visit on the return leg of today’s walk. I abandoned all attempts at any more shots as the wind was by now doing its best to land me in Bretherdale well in advance of our e.t.a. 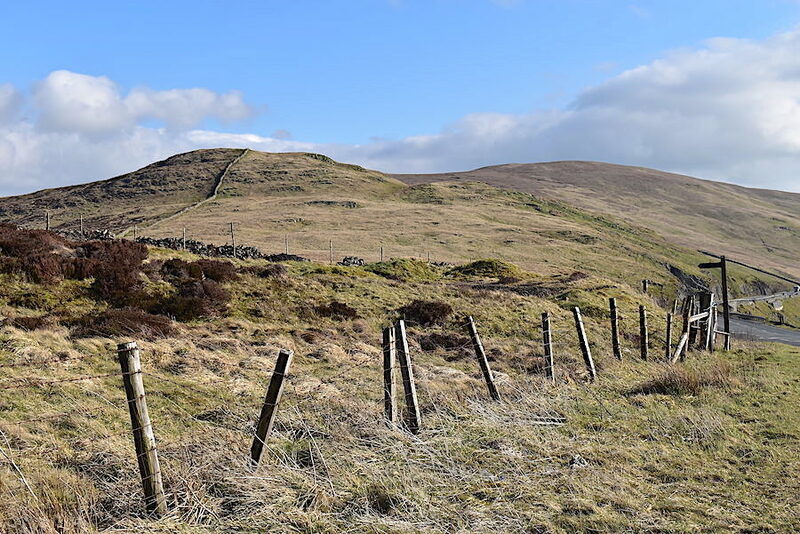 so I retreated from this higher point …..
….. down to the relative safety of the Breasthigh Road where a degree of protection from the wind was provided by the nameless top, out of shot on the right. Turning right down the Breasthigh Road would lead us down into Borrowdale, turning left would take us down to Bretherdale Head. As we’re not going to Borrowdale today and we’ll be walking up to Bretherdale Head later on we turn neither left or right but simply walk straight across the road and continue on up Dennison Hill …..
…..from where I took a look back across Borrowdale where the route of ascent for Ashstead Fell crosses the grassy shoulder above the trees before rising steeply to the flatter summit area. 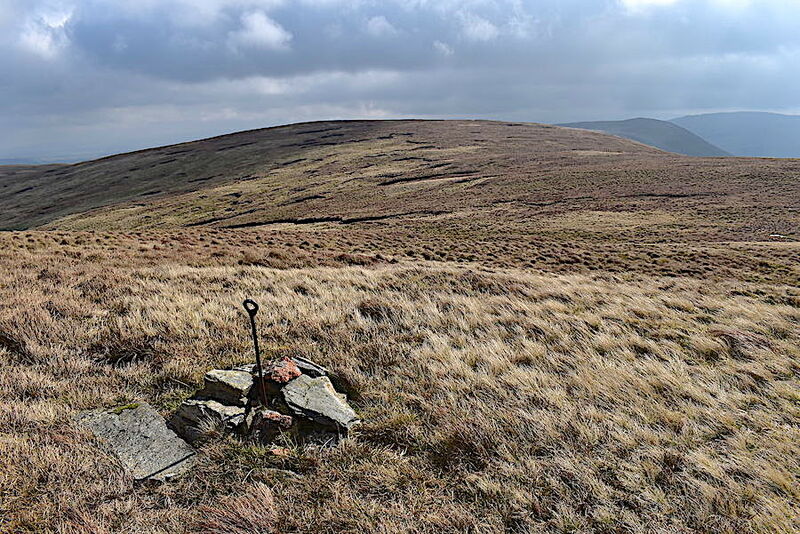 The summit of Whinash still bears the remains of an anemometer mast which once stood here to take wind velocity readings for the proposed installation, in 2005, of twenty seven wind turbines all along the Whinash Ridge from Shap summit to the Tebay Gorge. 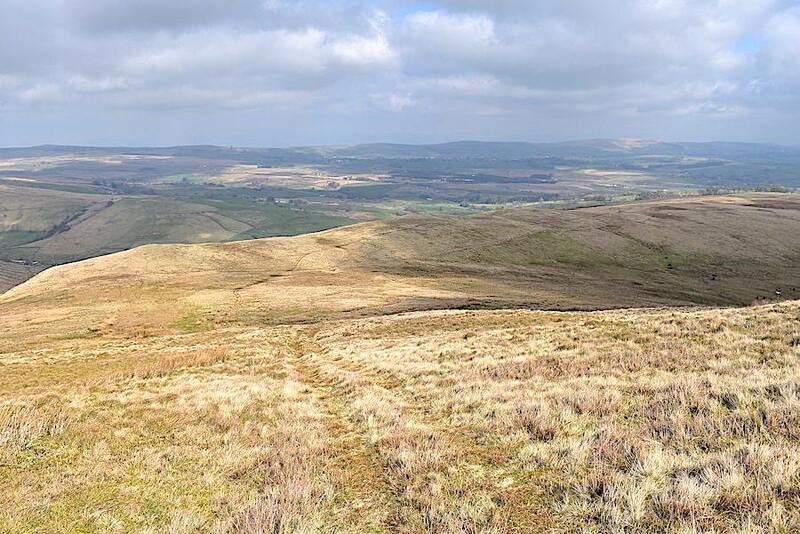 Each one would have been 377′ tall and would have formed the largest wind farm in Cumbria. Opposition to the proposal, both local and national, was fierce and after a six weeks enquiry the plan was thrown out in 2006. 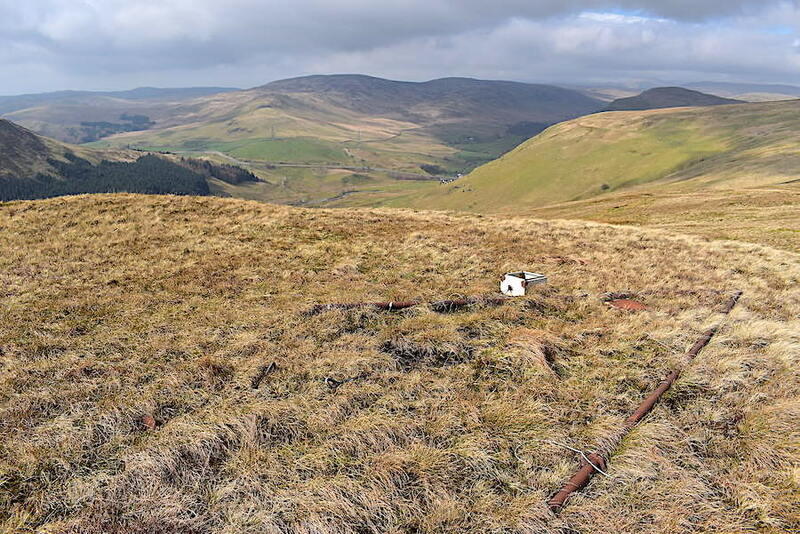 The remains of the former anemometer include the metal A-frame, a switch box and some metal stays, which presumably acted as footings for the stability cables supporting the A-frame. 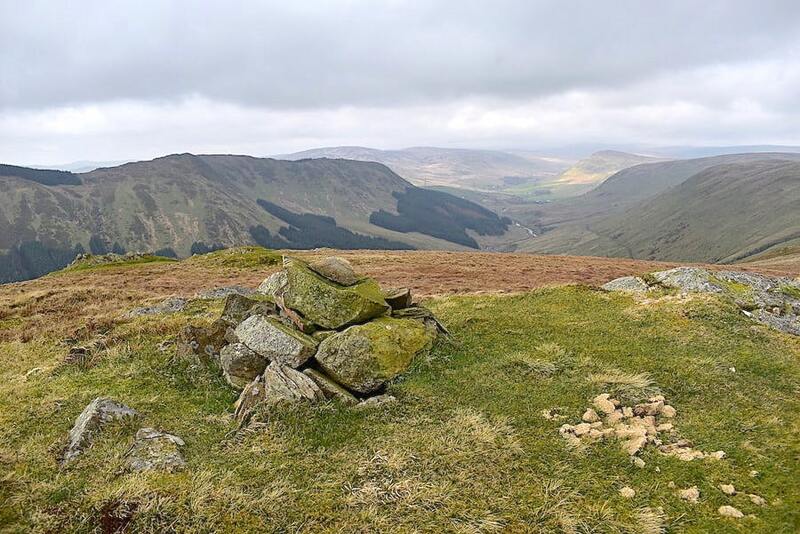 Chalmerston Wind Power, the company which submitted the proposal, should at least have had the decency to remove all of this and not leave their unwanted rubbish on Whinash summit. 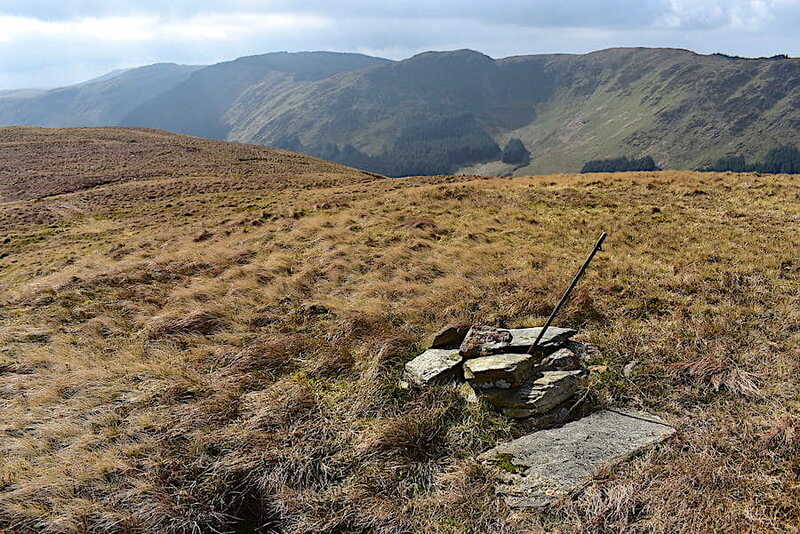 A short distance away from the discarded detritus is the summit cairn, nothing fancy just a pile of stones to mark the top, with a view of the fells along the south of the Borrowdale valley. 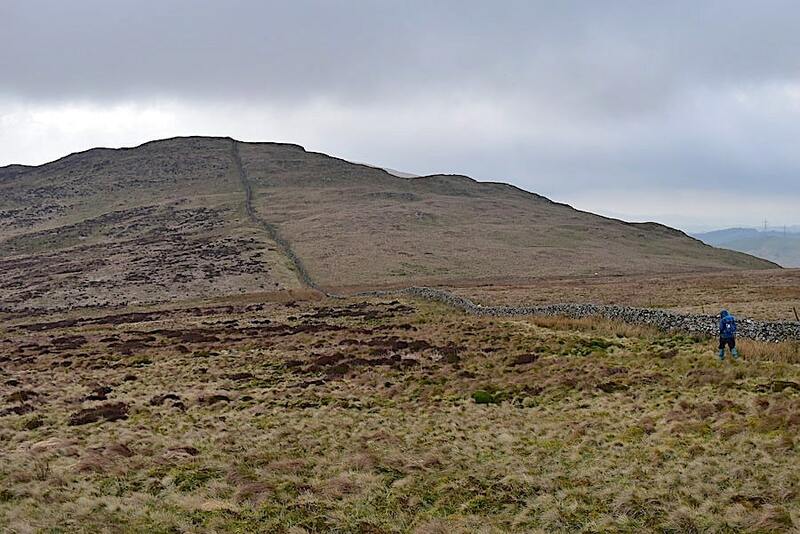 Whinash stands at 1545’/471 m.
We’re heading in this direction now towards the next nameless top, at 454m, between Whinash and Winterscleugh. Nothing strenuous to deal with and it would have been an even more enjoyable tramp across had it not been for the lively wind still blowing us sideways. 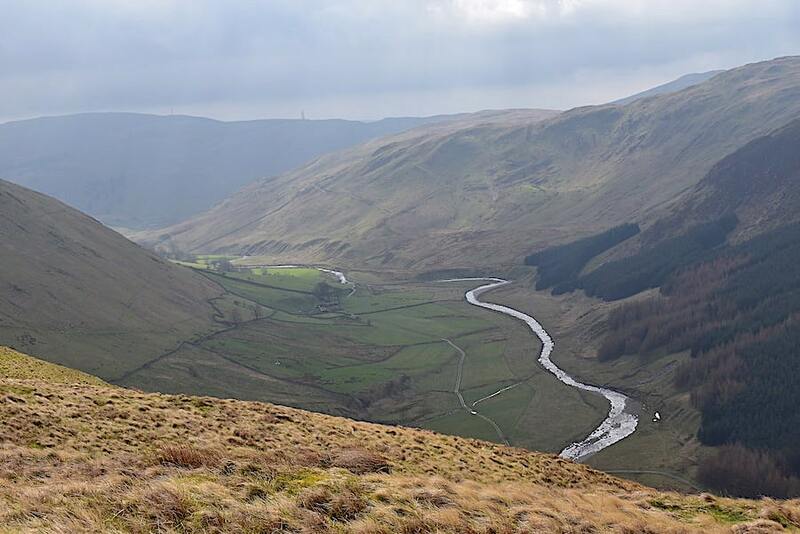 We’re following a well defined quad bike track on the way across but we left it temporarily to take a look at Borrow Beck, a silver ribbon snaking its way down the Borrowdale valley. 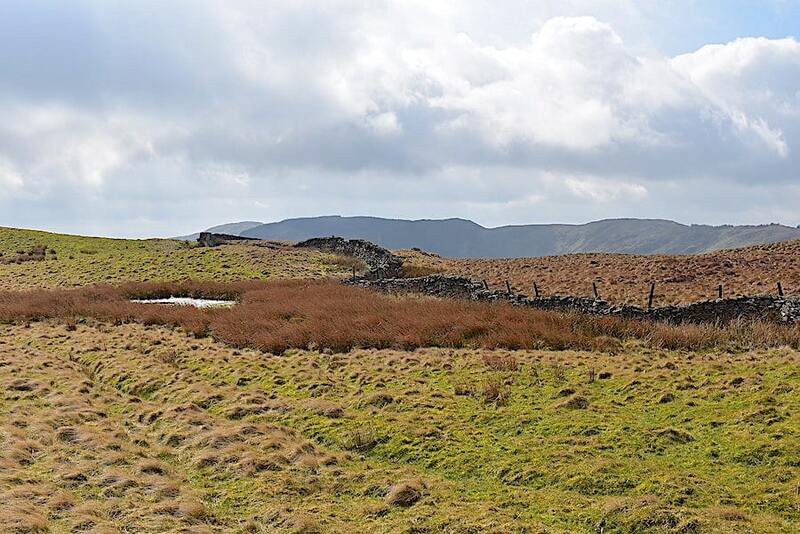 Straight across from us are the humps and bumps of Mabbin Crag with Castle Fell behind it on the left. 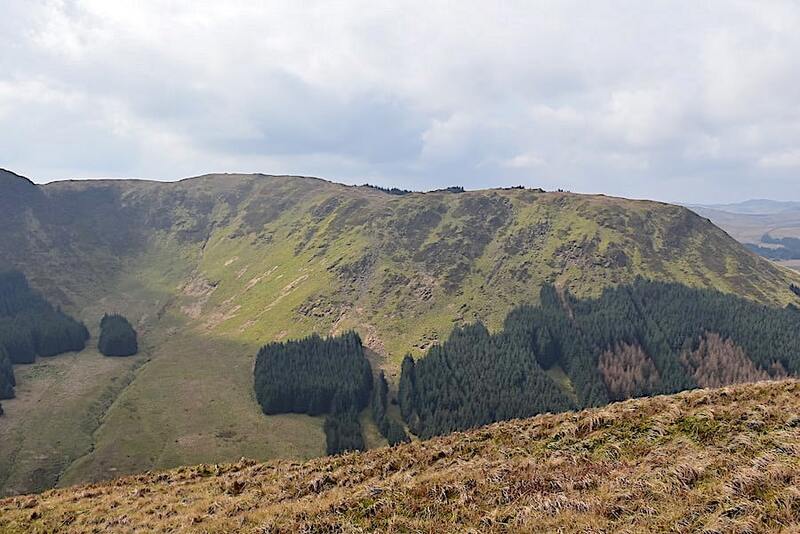 There’s some great walking to be had across there, and if you walk the ridge and then back through the valley on a decent day you could have 9.25 miles of pure enjoyment. 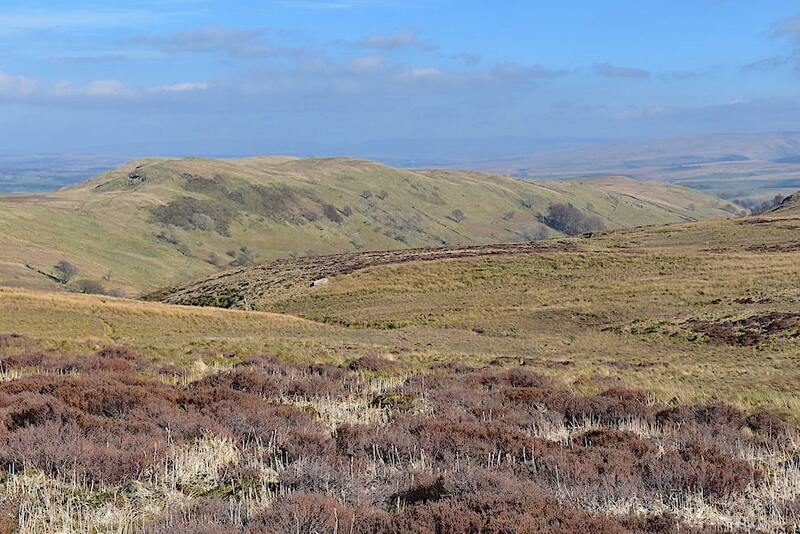 A look across to where those 9.25 miles of enjoyment started for us as I take a look across to the undulating top of Ashstead Fell. 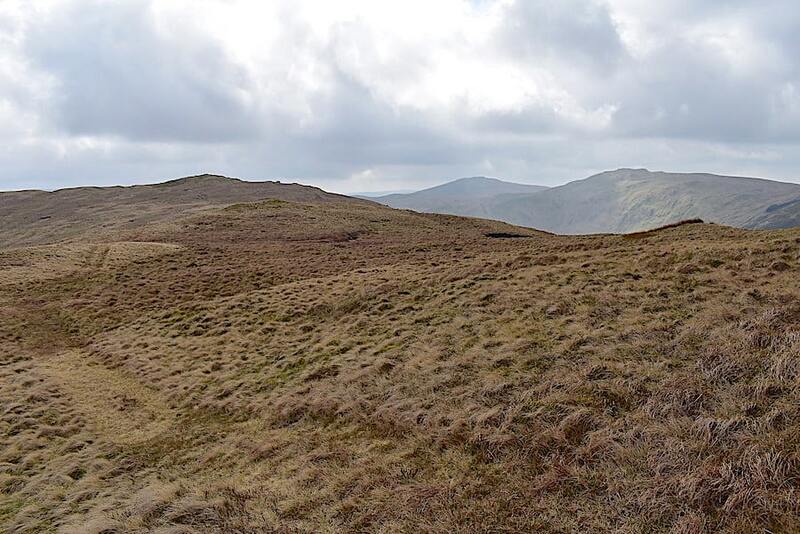 Looking along Borrowdale again as we look ahead to the summit of Winterscleugh, over on the left. 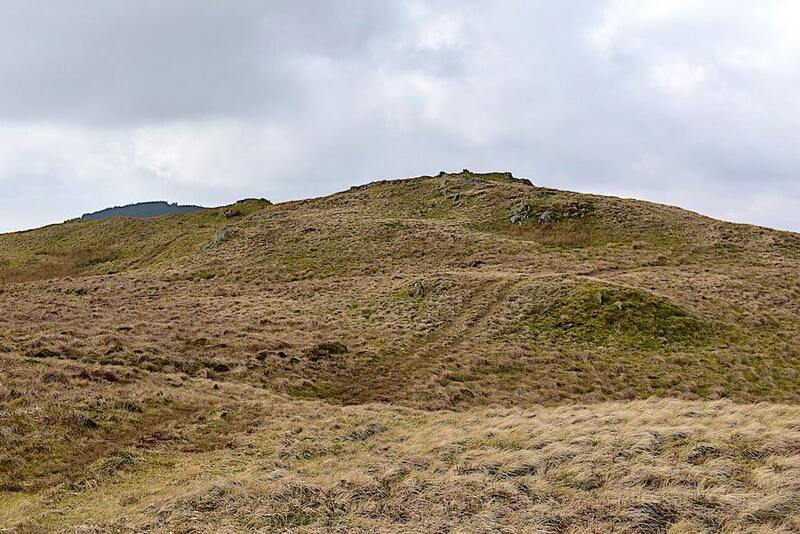 Back on the quad bike track again and we carry on walking over the rough pasture land to …..
….. the summit of Winterscleugh at 1522’/464m and where our battle with the wind eventually comes to an end, although not before it almost knocked me over while at the same time whipping J’s specs off just as he was putting them on to take a look at the gps. It was fortunate that he was still holding on to them or they would have been hurled down into Bretherdale, never to be seen again. 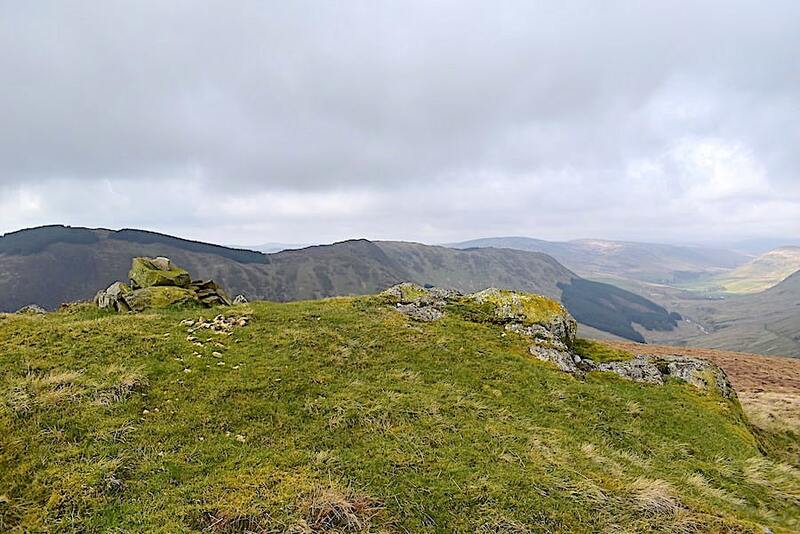 A quick look across Borrowdale at Castle Fell and Whinfell Beacon from Winterscleugh summit before I dropped back down again to gain a little respite from the wind. 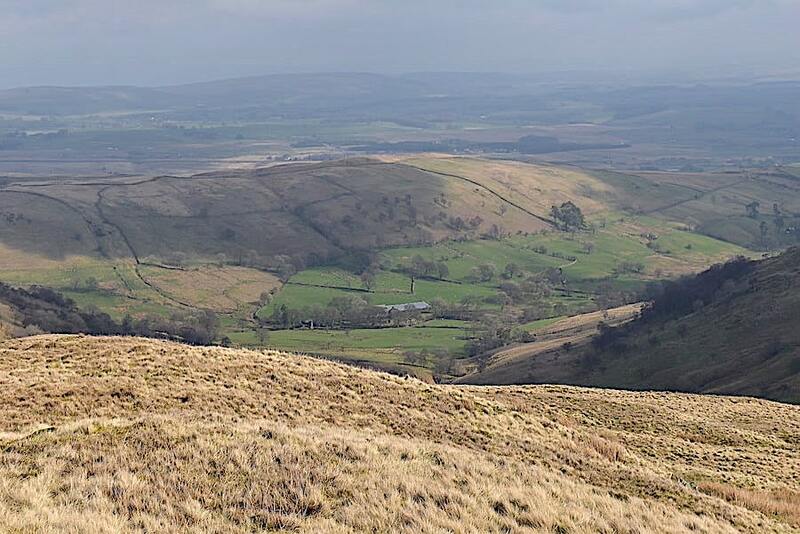 Out of the wind and able to stand still once again I took a look over towards Roundthwaite Common and beyond to where Greyrigg’s communications masts are visible on the skyline. Winterscleugh summit with the Borrowdale skyline behind it, after which it was time to drop down out of the wind and head north eastwards for Bretherdale. 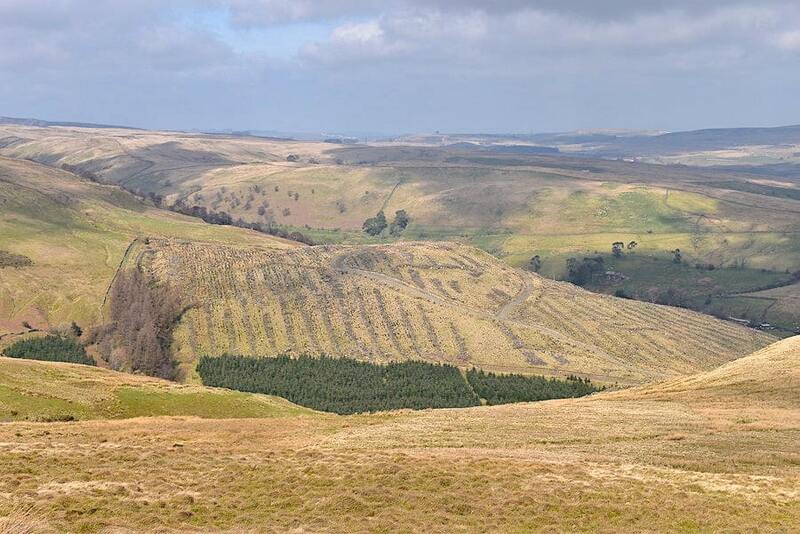 A look back to the top of Winterscleugh from the quad bike track and which we will follow all the way down to Bretherdale. 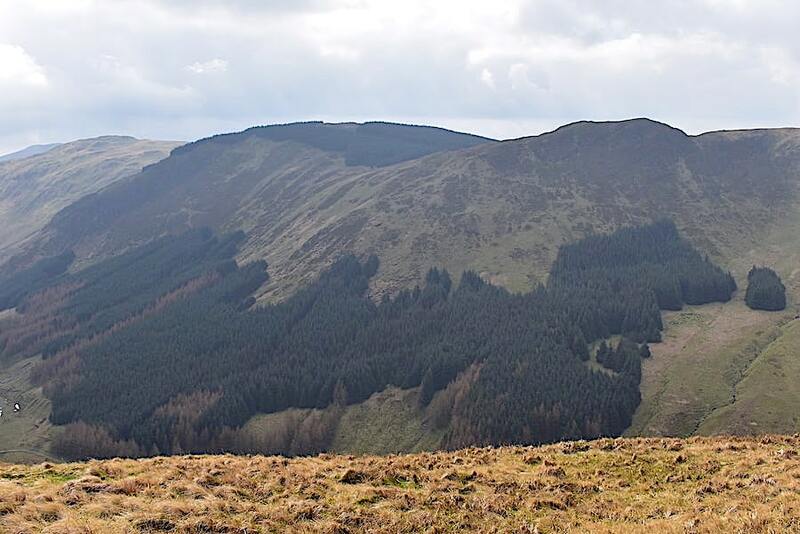 This really was an enjoyable tramp, the route is clear to see, the sun is out, the path is reasonably firm and, best of all, we are finally out of the wind. Hoods come off, jackets are unzipped and there’s a spring in our step, especially as the cloud is really beginning to break now and the sunny spells are becoming longer. Below us, to our left, is what’s left of Corkham Wood. 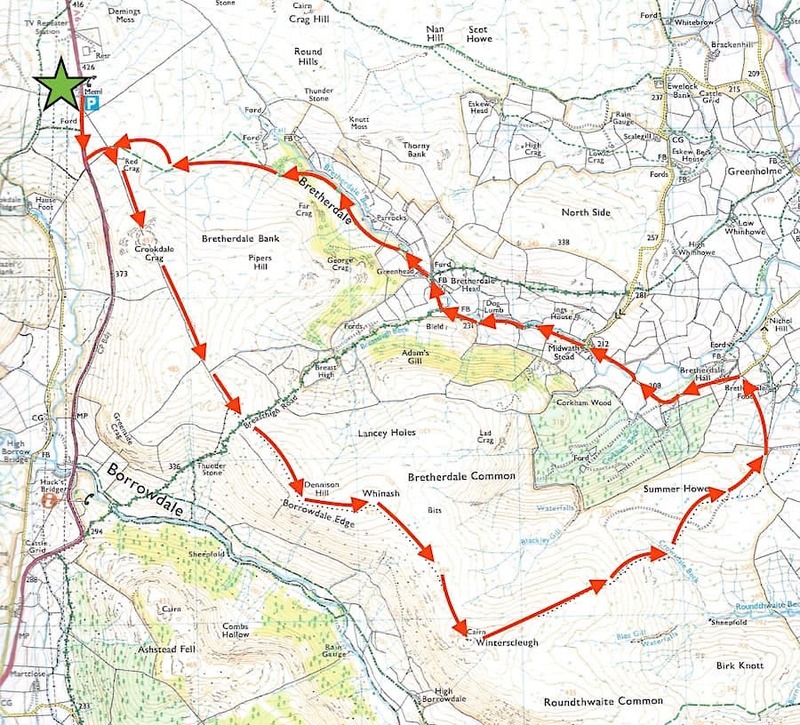 Our route map shows the area to be full of trees so a heck of a lot of felling has been going on lately. 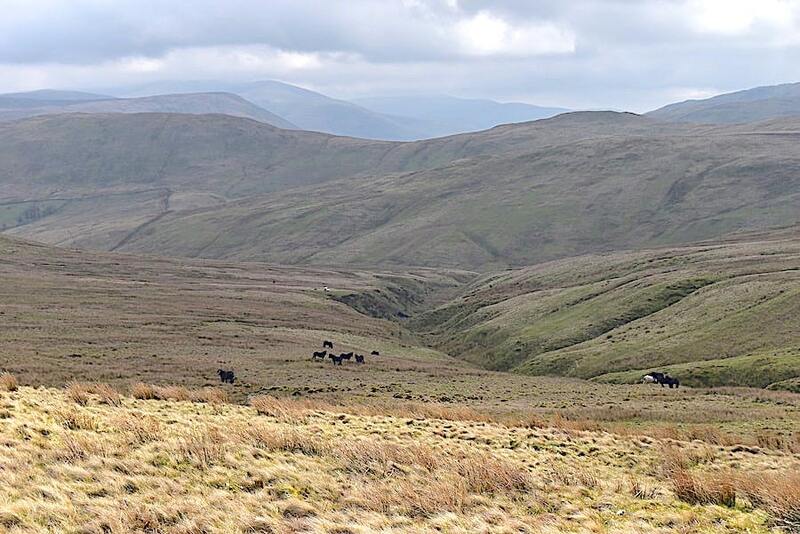 The view back up to Winterscleugh as we make our way down the aptly named Wet Sike …..
….. and a look across to our left at the fell ponies grazing above Blea Gill. 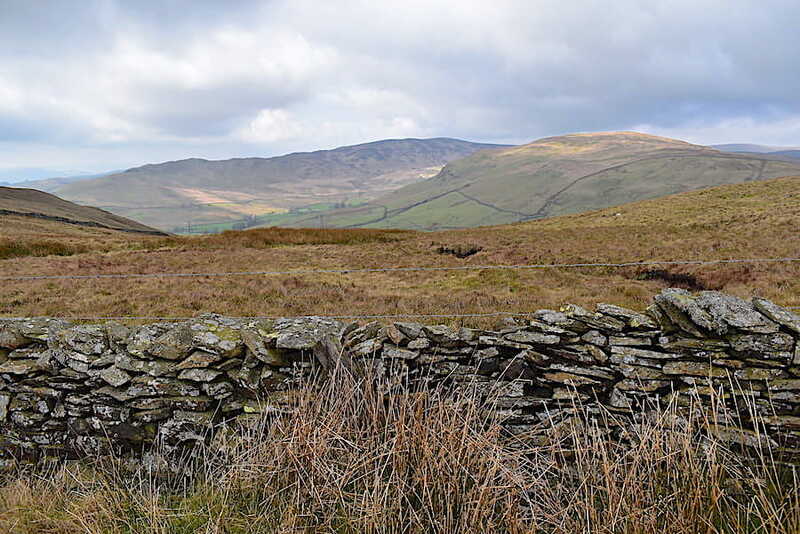 The Howgills appear in the gloom beyond the ridge connecting Belt Howe, on the right, with Casterfell Hill, on the left. 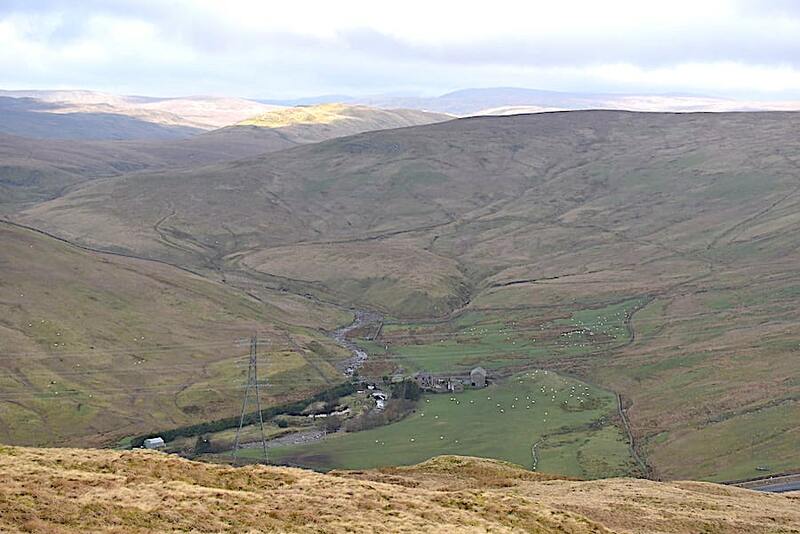 Its very gloomy over the Howgills but in the other direction …..
….. we have a lovely view along a very sunny Bretherdale …..
….. so I zoomed in for a closer look. 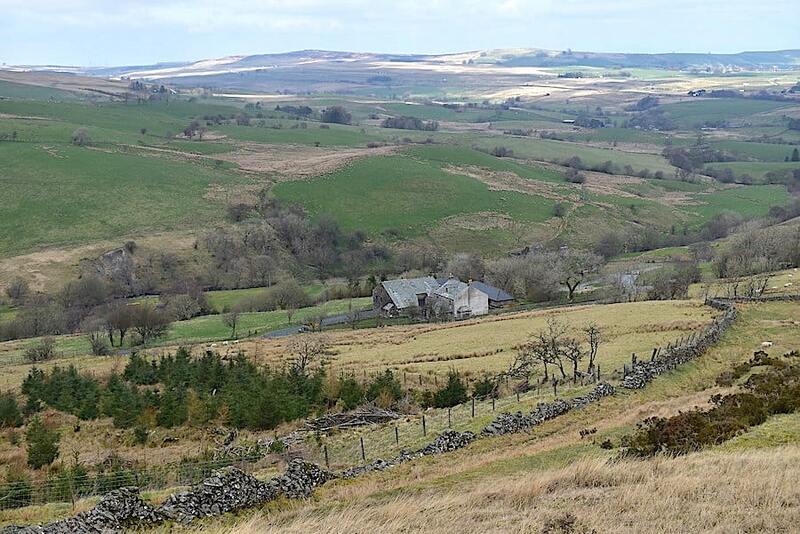 The hamlet below is Midwath Stead with the abandoned buildings of Ings House on the hillside just above it. 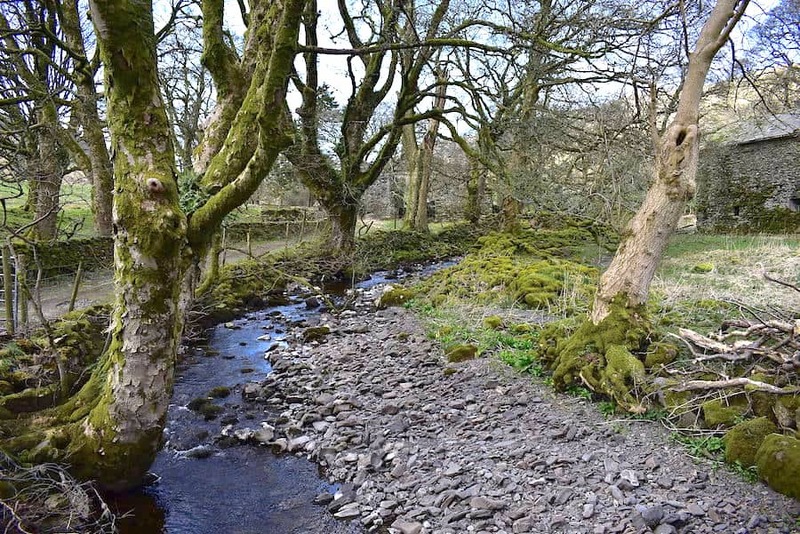 We’ve crossed Crowsdale Beck, wandered over Summer Howe and are now almost down into Bretherdale where Bretherdale Hall is immediately below us. 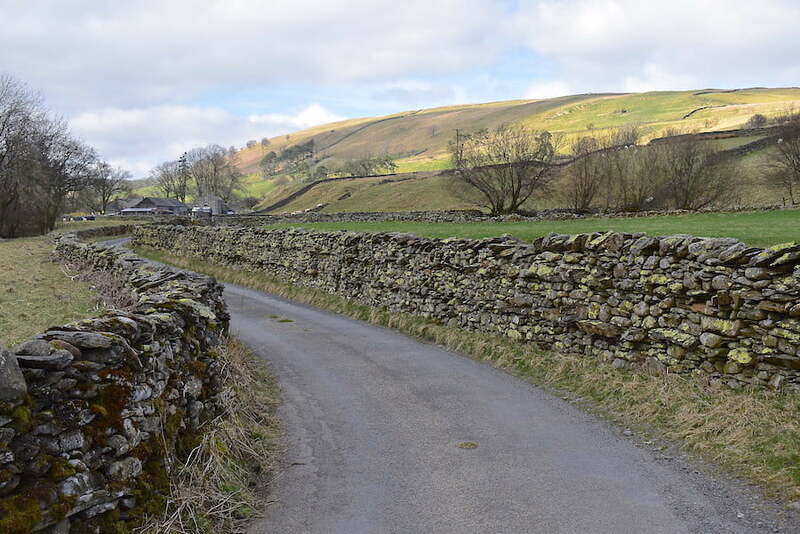 The OS map shows no path going directly down to Bretherdale Hall but we followed one all the way down straight onto the little tarmac lane which serves the very small Bretherdale community. 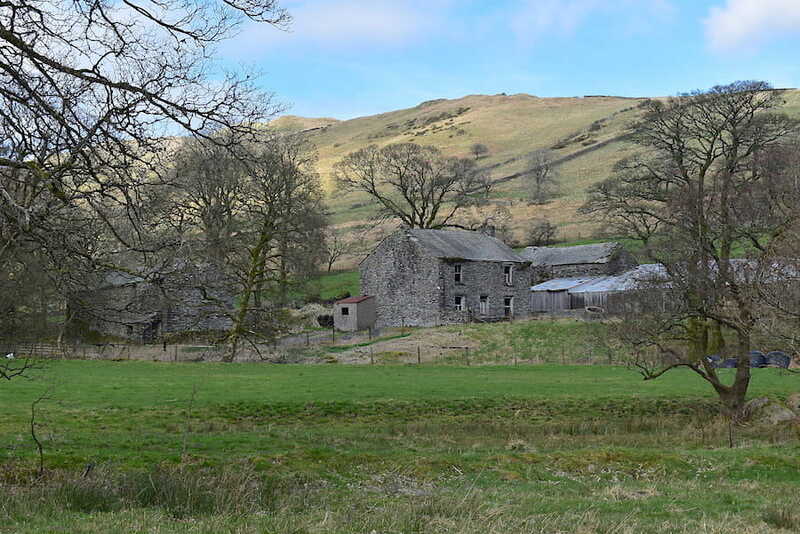 Bretherdale Hall from the tarmac lane alongside it …..
….. followed by a view of Bretherdale Barn with the Hall behind it on the right. 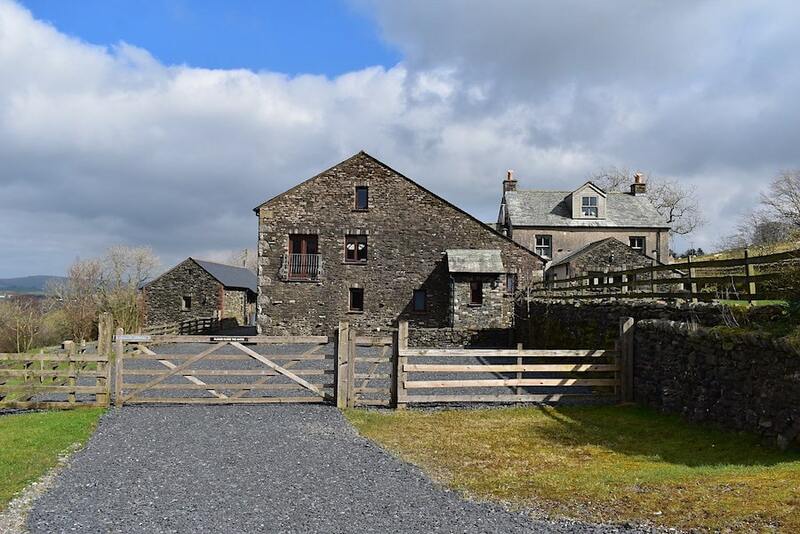 These are now very up-market holiday rental properties, the Barn sleeps ten people, the Hall sleeps eight, so if you have a big family, plenty of money and want a peaceful holiday in a lovely corner of The Lake District this could well be the place for you. 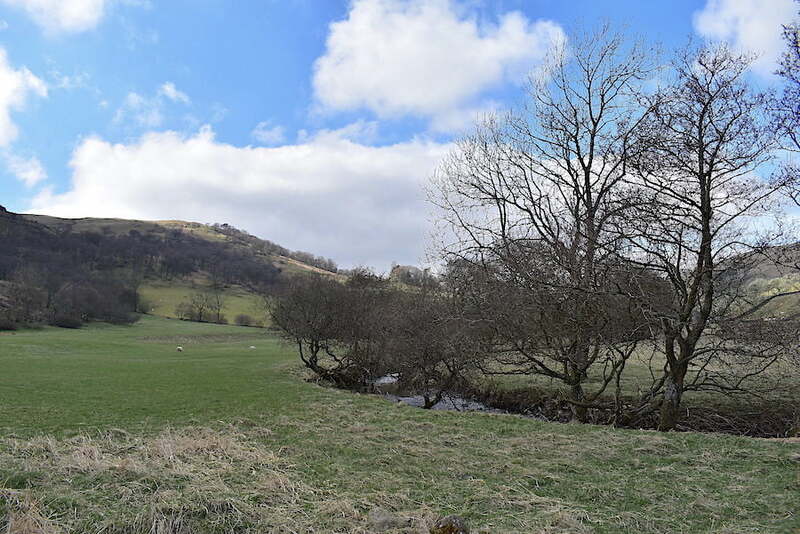 The view into Bretherdale as we walk the tarmac lane alongside the beck. Heading towards Midwath Stead where there appeared to be a farmhouse and about half a dozen other dwellings, some lived in, while a couple of them looked as though they might be holiday homes. We heard a vehicle on the road behind us and looked back to see a postman getting out of his van to deliver the mail to one of the houses. 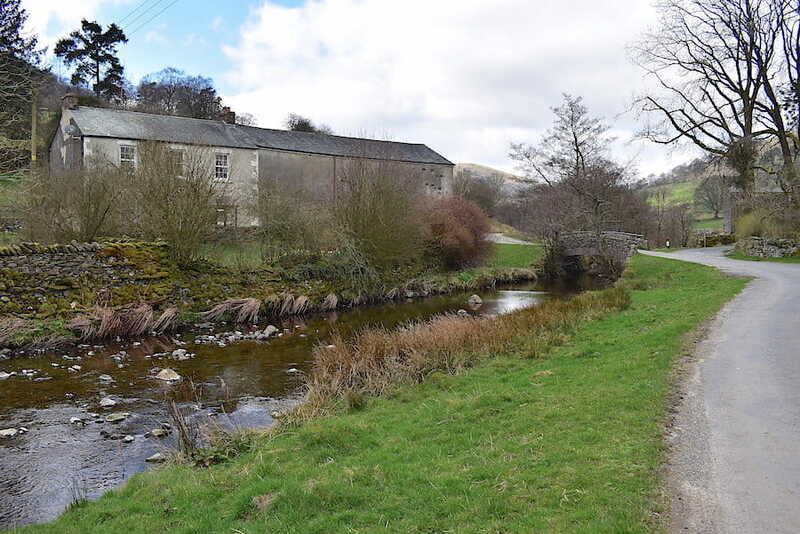 As we reached the bridge across the beck he pulled up behind us, got out and delivered more mail to the house on the left of the shot. At the bridge he turned up the lane to the right heading for his next destination. 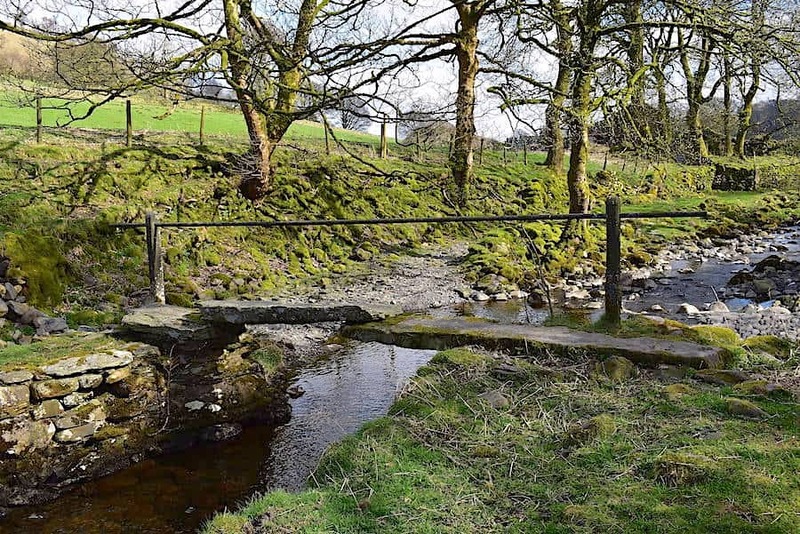 We continued on across the bridge and took the tarmac path alongside the beck. Through the trees a limited view of the abandoned Ings House. 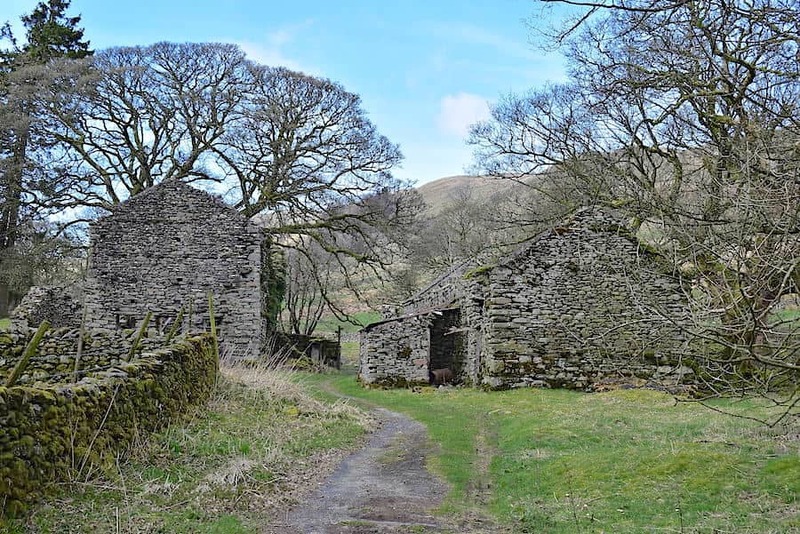 Abandoned buildings are a feature of Bretherdale, here’s another one which we took to be the Dog Lumb marked on the map, and, according to one old directory, once occupied by Mr James Hayton, although the directory gives no indication of when he lived here. We took a break here, as it was just about lunchtime, and we perched ourselves on the remains of another derelict building and tucked into our sandwiches. 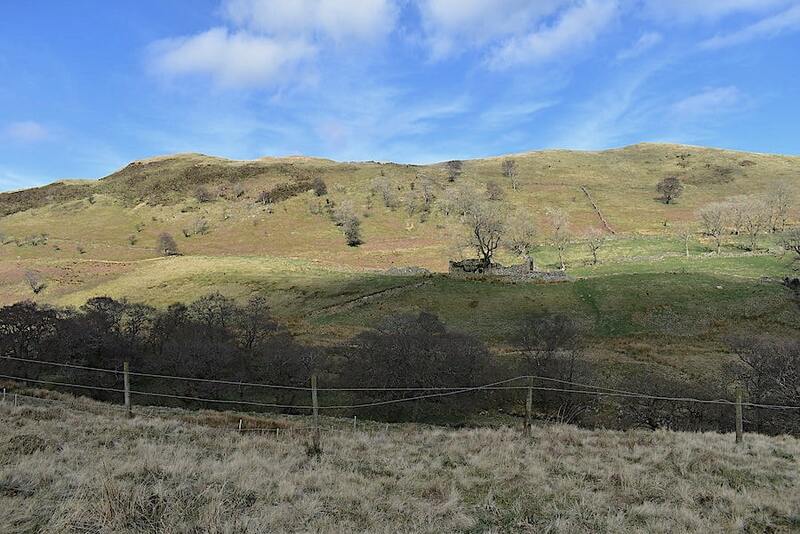 A lovely little spot with the sounds of the beck providing a pleasant soundtrack as it burbled its way through the valley, just below the fence line. As we were packing things away after our break one of those ‘moke’ style vehicles came along, with two chaps on board and headed up to Bretherdale Head. 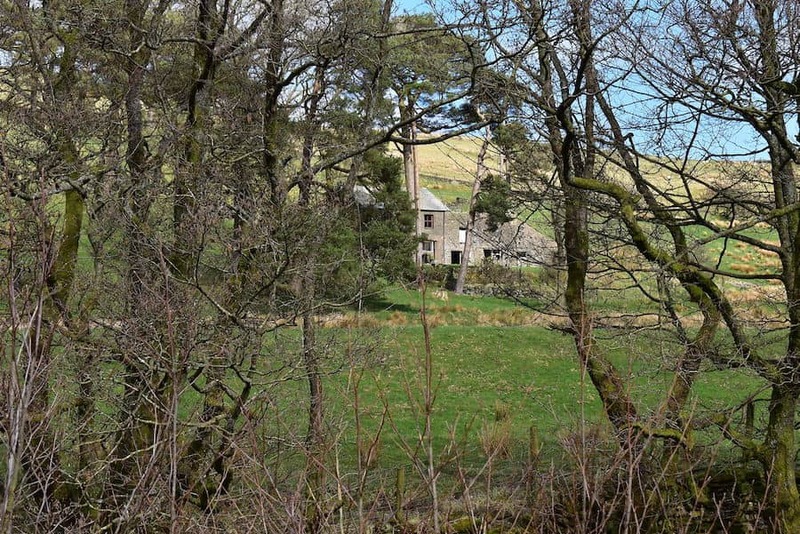 That was also where we were heading and across the field are the abandoned farmhouse and farm buildings situated there. 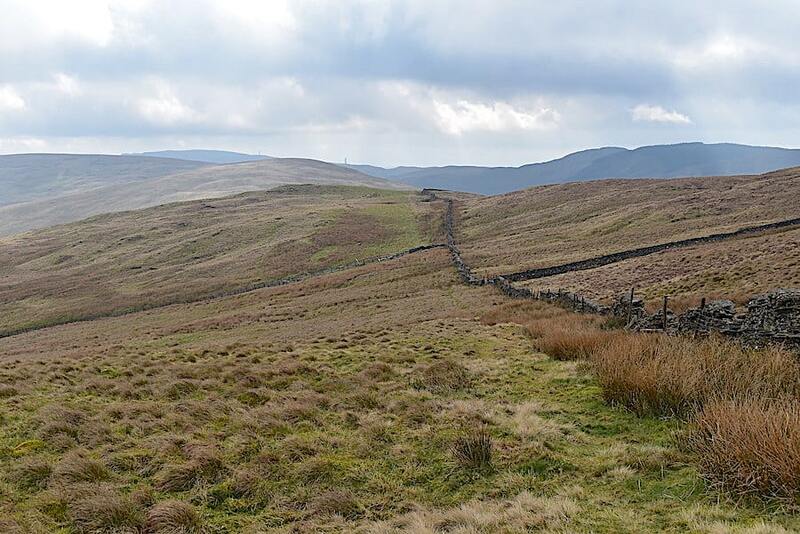 The tarmac lane comes to an end at this point, where George Crag is on the skyline, and where the path divides. 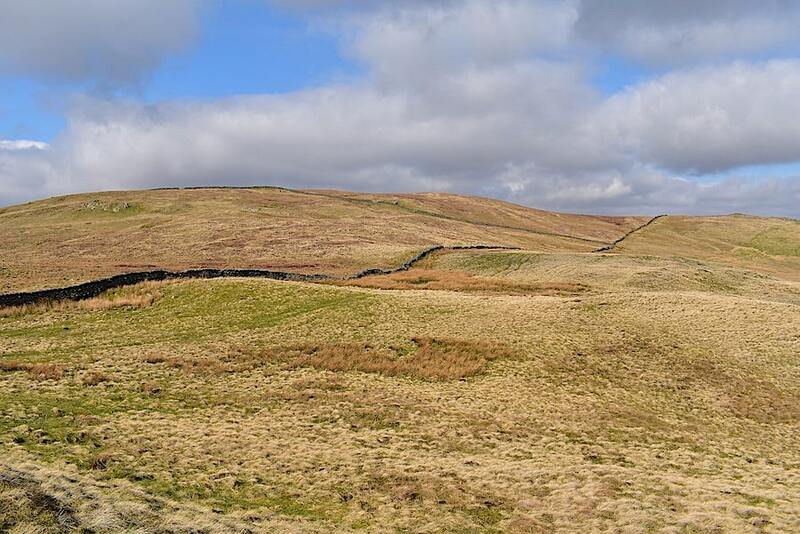 To the left it becomes the Breasthigh Road and to the right it leads over to the derelict farm and even further into Bretherdale. We take the right hand fork and, having negotiated our way around a very long and very deep puddle right at the beginning, we make our way over to the buildings. The ‘moke’ type utility vehicle was parked out of shot on the left, beside the closed doors of the long wooden barn, and we could hear the two men who were aboard it moving around inside the barn, doing we knew not what. Whatever it was I had the feeling it didn’t have anything to do with farming, they just didn’t look like farmers to me. I did wonder briefly if they were entitled to be using the old barn given that the whole place is derelict. 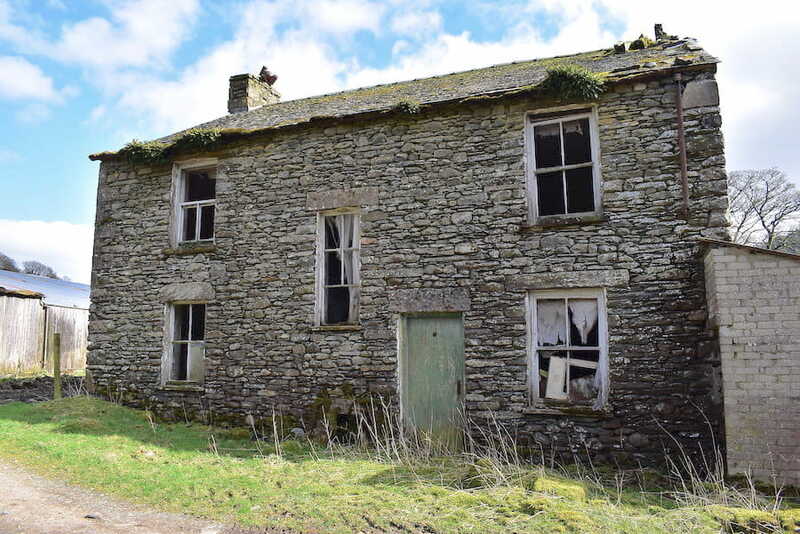 The abandoned farmhouse wouldn’t look out of place in a psychological thriller. As we walked past it a gust of wind blew the tattered remains of the curtains horizontal through the all broken windows making it all seem slightly surreal. 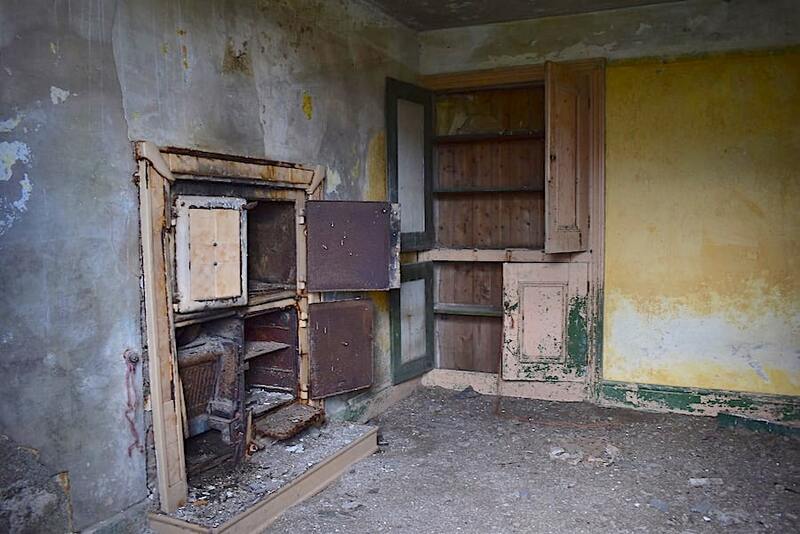 Round the back of the house and a peep through a window reveals the old kitchen range and store cupboard. It would probably have had a wooden chair on either side of the range, a table and chairs in the middle of the room, and somewhere along one of the walls there might have been a sideboard or chest of drawers. How do I know? Because I lived in a village where the houses had much the same layout although they certainly weren’t as dilapidated. The kitchen range we had was half the height of this one and all our meals were cooked on it or in it. My mother regularly made our bread in it, and the bowl of dough, covered with a clean tea towel, would be put on the hearth to rise before being put into the loaf tins and baked. Once a week the whole thing was thoroughly cleaned and then ‘black-lead’ paste, as it was called, would be applied with a cloth and then buffed up with another clean cloth to give the whole thing a nice sheen. I doubt there was lead in the polish, it was most likely a mix of graphite and water, or some other liquid, which formed the paste, but that’s what it was always called where I lived. I expect the last owner of this kitchen range did much the same sort of thing on a regular basis. An ornate fireplace in another ground floor room on the other side of the door so this may have been the family sitting room. There are visible signs of what was once a little garden here at the back of the house, a broken low wall, railings lying in the overgrown grass, spring flowers just beginning to show through. 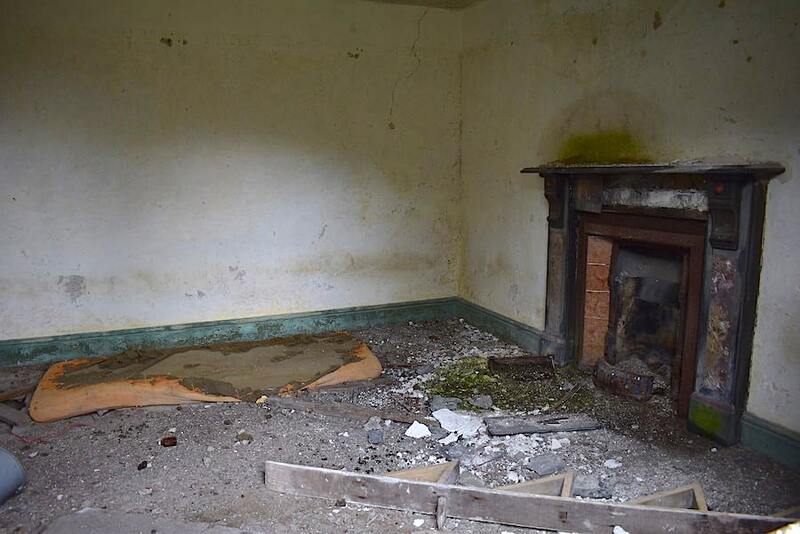 There were two more much smaller rooms on the other side of the house, one full of old furniture and bits of junk, the other containing only an old leatherette armchair, so it was difficult to conclude what purpose they may have once served. The afore-mentioned directory mentions that a Mr William Wilson once lived here, again no indication of when that was. We returned back to the beck after our exploration, crossed the bridge and carried on along the path you can see in the shot. We didn’t have to walk far before the next abandoned house, Greenhead, we think. 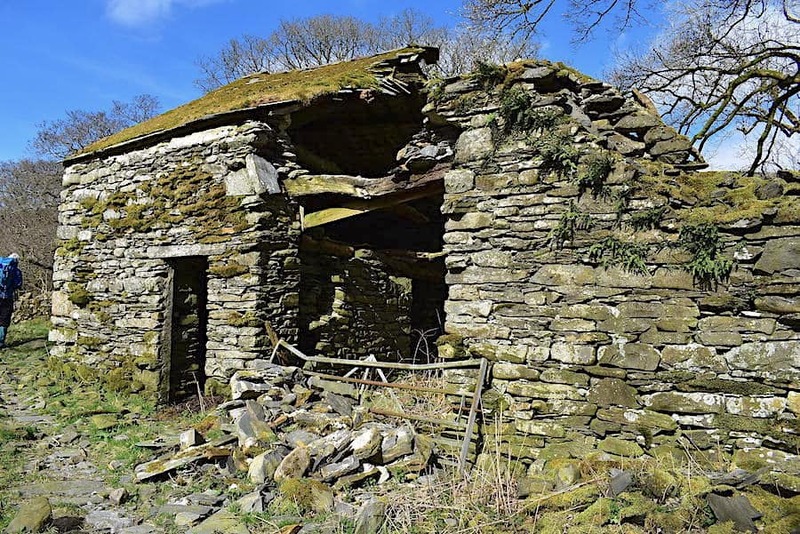 The main dwelling house I would assume, and next to it …..
….. are the equally dilapidated outbuildings. You can’t help but think about the former occupants and their daily lives as you walk through the buildings and why, eventually, these homes and ways of life were abandoned. 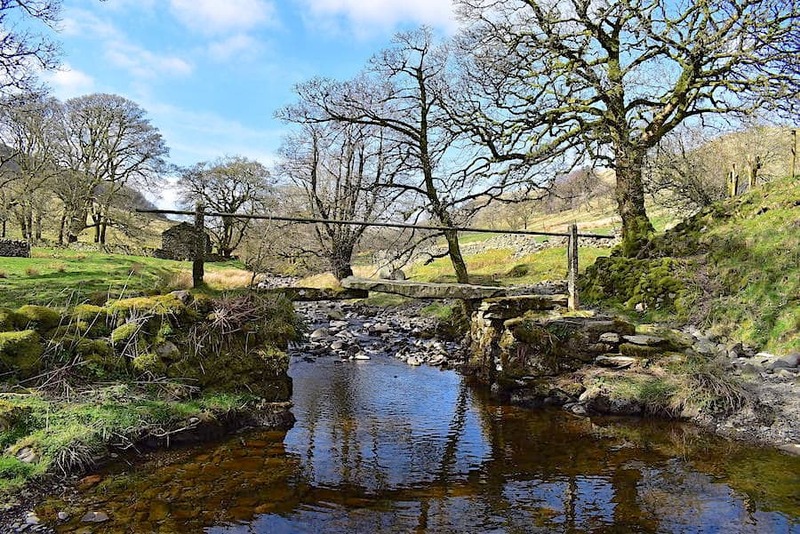 At the end of the track we arrived at …..
….. this old three slab clapper bridge spanning the beck, although I doubt the handrail would have been there originally. 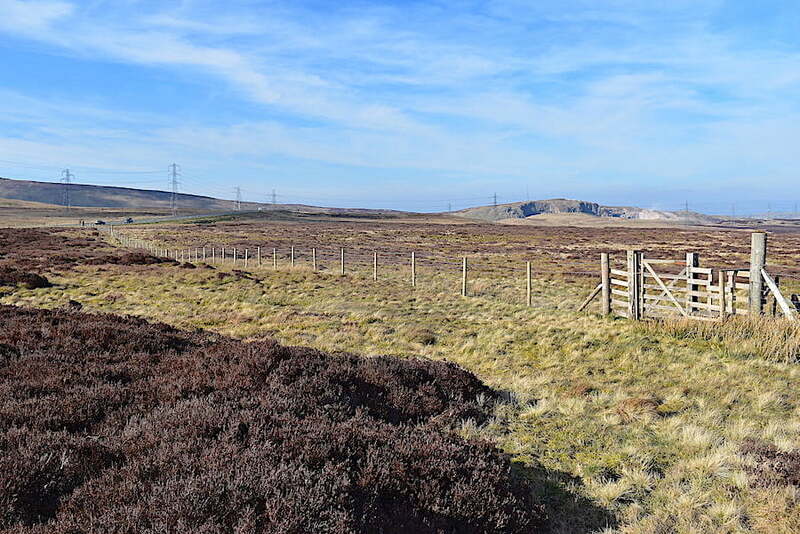 Close by the buildings off to the left of the shot is a three finger signpost, one finger of which pointed up the valley and was clearly signed ‘A6 1 and 3/4 miles’. Something you don’t expect to see while out walking in a remote area. We didn’t cross the bridge as the footpath would only take us back to Midwath Stead but I walked upstream a little way for this shot of it looking downstream. It might look a little precarious but since it has held up all these years it will be perfectly safe to use. From the bridge the ground eventually begins to rise away from the beck and the path more or less disappears in the very rough and very wet ground and the going becomes more uneven, making this section very tiring on the legs, even more so now that the sun is blazing down on us. 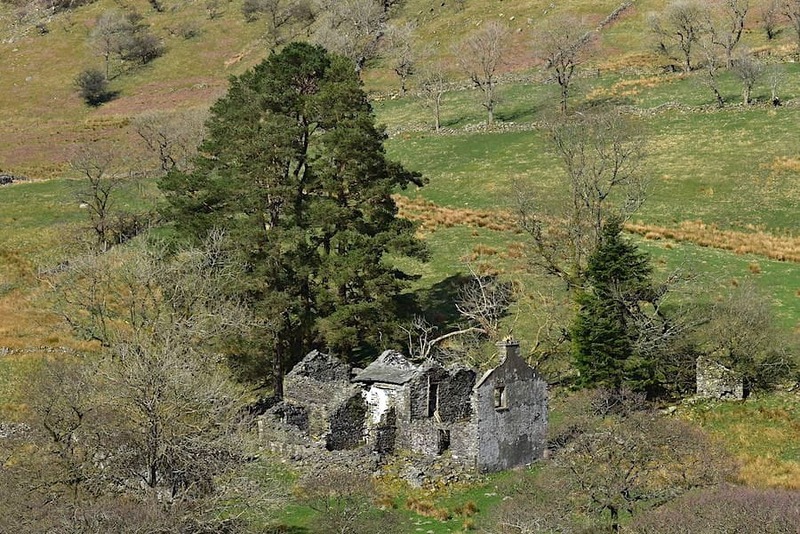 Below the tree up ahead is …..
….. the last of the abandoned houses that we came across. 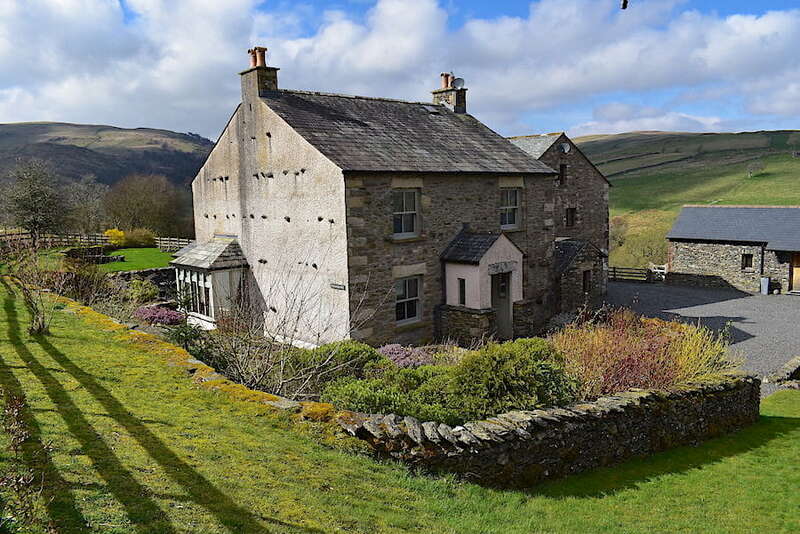 This one is Parrocks, once lived in by Mr William Clark according to the old directory. 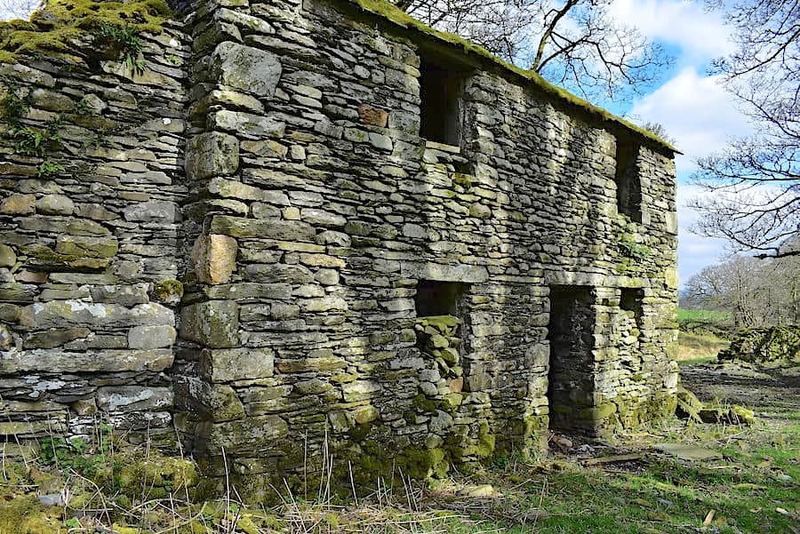 We could see no obvious way of getting up to this property but clearly there must have been one at some time but which is now overgrown and forgotten. A look back to Parrocks as we begin to climb a little more steeply out of the valley. Signs of tree planting but nothing much seems to have come of it. 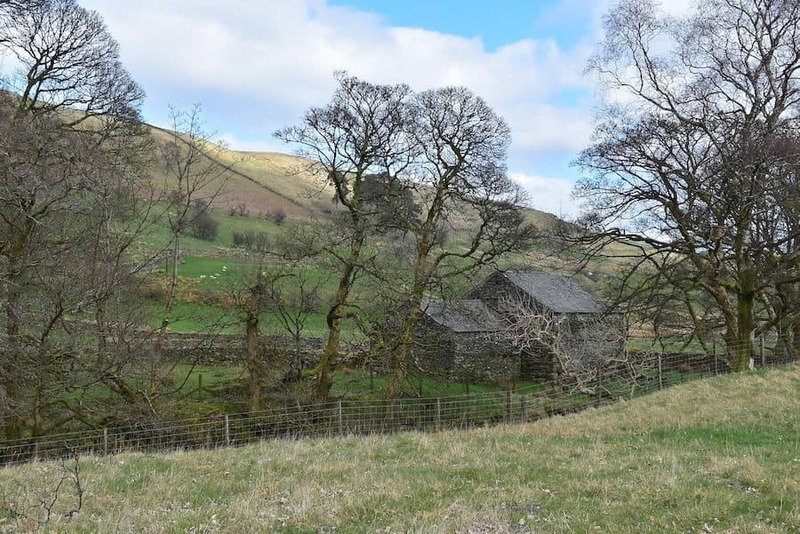 We’re well above the beck now and on the fellside opposite is what looks like a derelict barn which probably belonged to the Parrocks farm we’ve just passed. If the grazing across there is anything like as poor as it is on this side then it wouldn’t be surprising if the reason for all these abandoned farms stems from that. 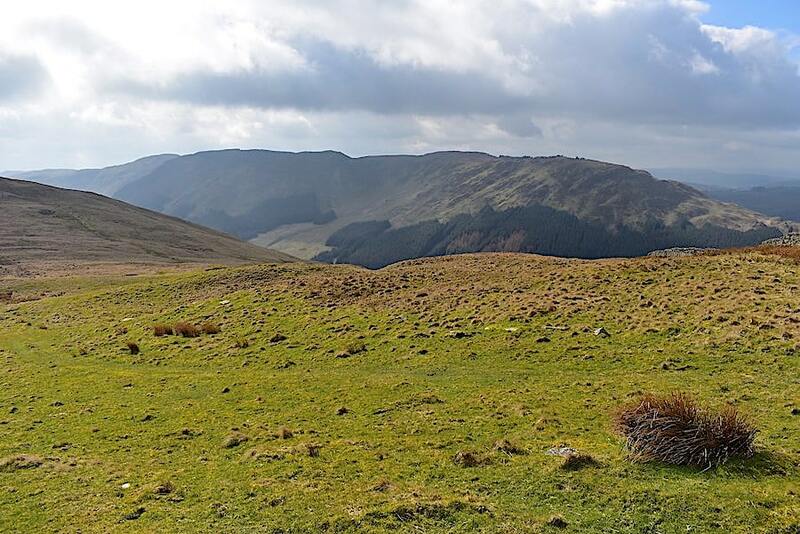 Sheep and cattle wouldn’t find much to their liking along here. 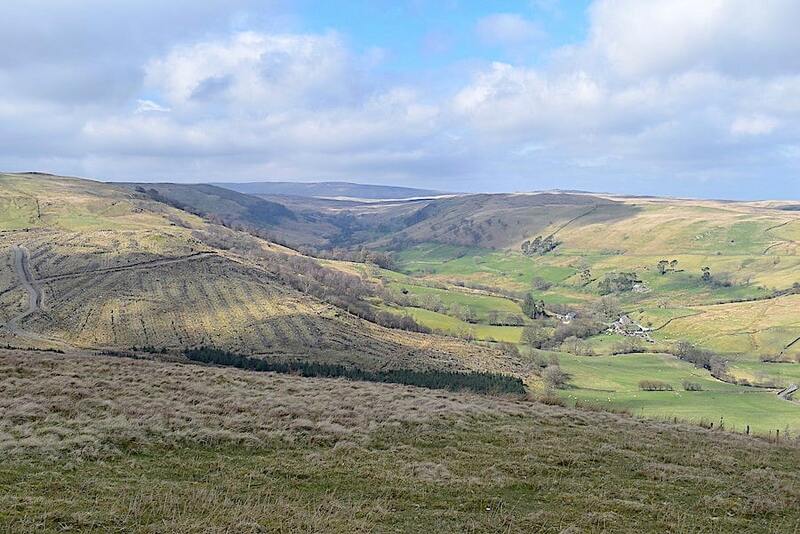 A look back into Bretherdale as we reach the top of the climb and where the path, intermittent as it was thus far, finally disappeared. The green line on our route map shows the existence of a route but, despite a search, no sign of it appeared. I’m not saying it doesn’t exist, simply that we were not able to locate it. 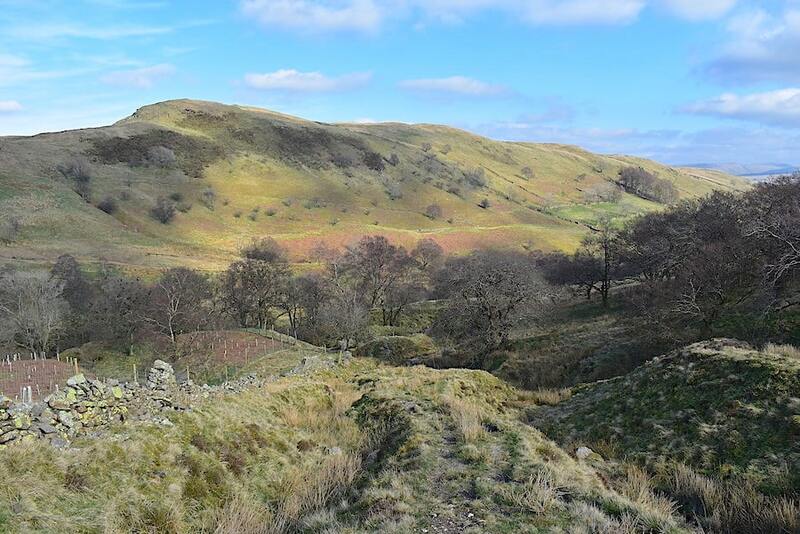 It didn’t present much of a problem though because …..
….. with Crookdale Crag on our left all we had to do was walk westward up Bretherdale Bank until we eventually met up with the wall we had walked alongside to begin with. Although the ground wasn’t steep the absence of a well trodden path and the boggy, tussocky nature of the ground made the final haul up through the heather clumps and mossy mounds very hard going …..
….. so it was a relief to reach the second stile we crossed this morning and walk back to the first stile on a proper path once again. 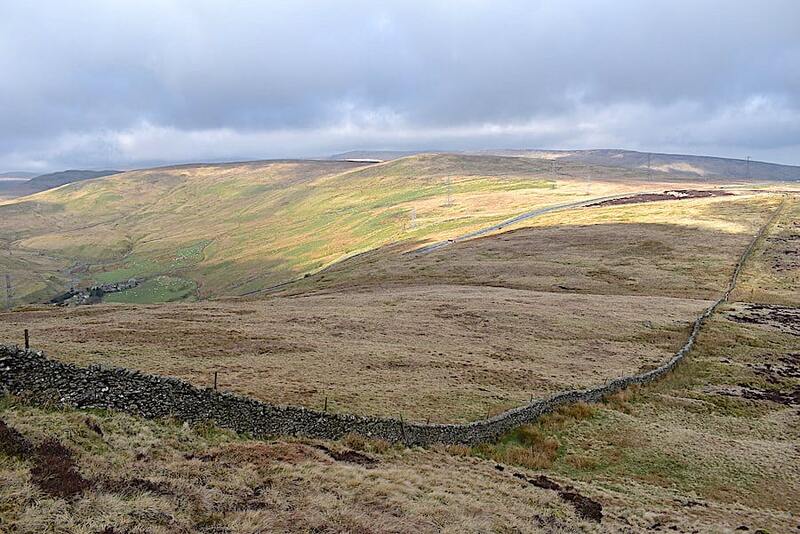 Another car has joined ours in the A6 lay-by over on the left, and Shap Pink Quarry is rearing up over to the right. 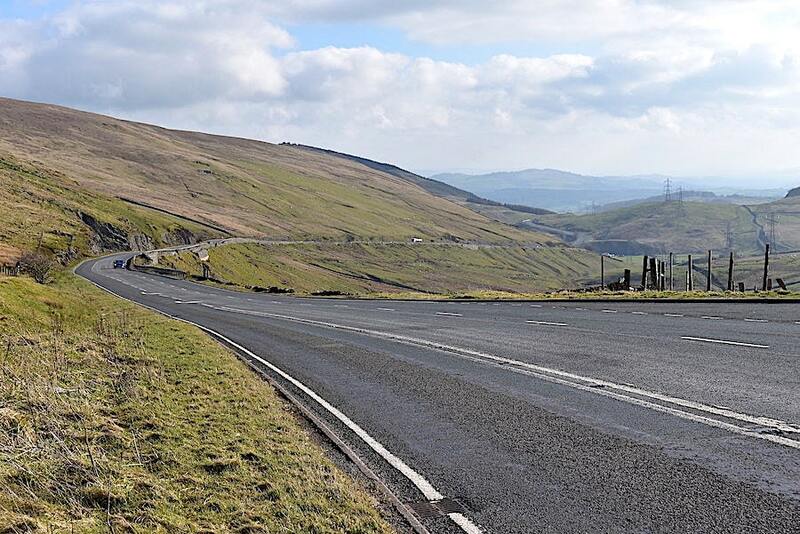 The view down the A6 towards Kendal looks much more welcoming that it did this morning although the wind up here hasn’t abated one little bit. 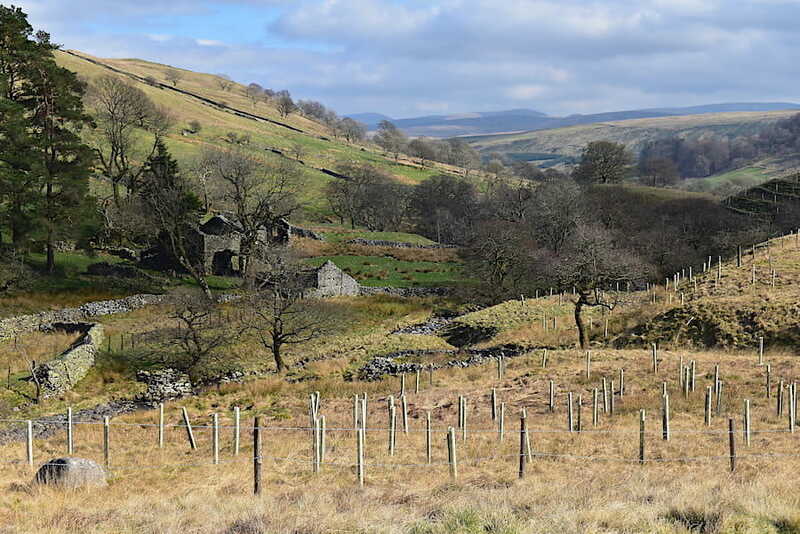 Before we make the short walk back to the lay-by I took a look back at Crookdale Crag from the roadside stile. The start of a walk which definitely consisted of two halves both in terms of the terrain and the weather, a windy and cloudy walk over some remote moorland fells to begin with, followed by a warm and sunny walk through a lovely, slightly mysterious and rather forgotten valley where time certainly does seem to have stood still. 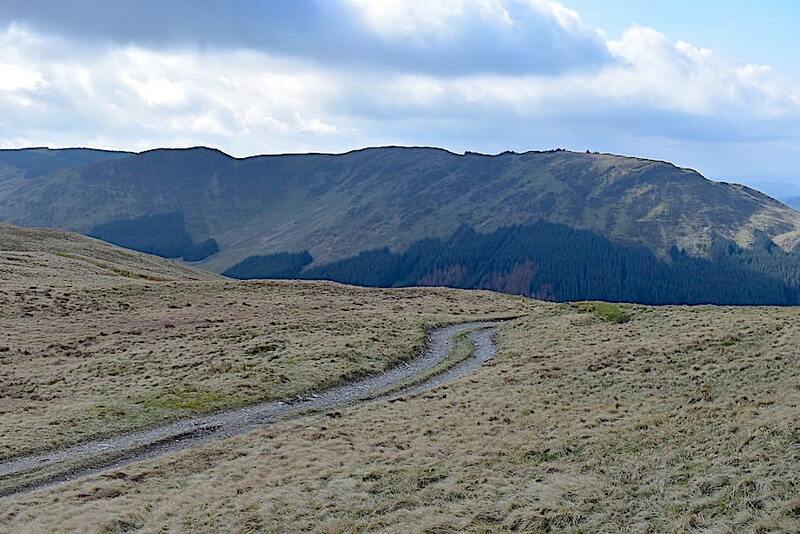 Apart from not being able to locate the last section of the path, always assuming that it does really exist, which was a little annoying, we’ve had a thoroughly enjoyable walk and one that we would certainly repeat, if only to find the end of that darned path.